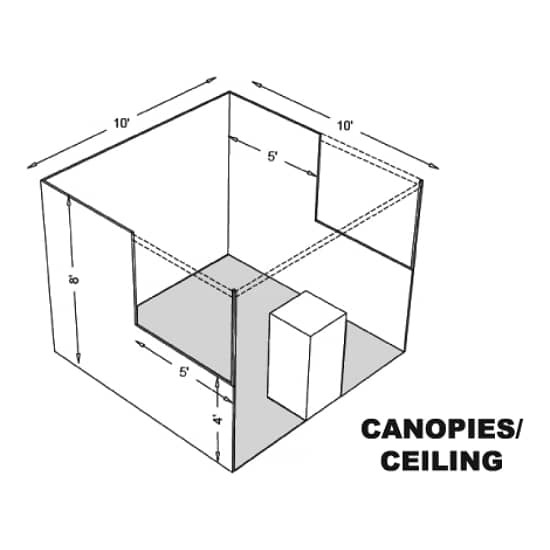 Dimensions: For purposes of consistency and ease of layout and/or reconfiguration, floor plan design in increments of 10′ has become the de facto standard in the United States. 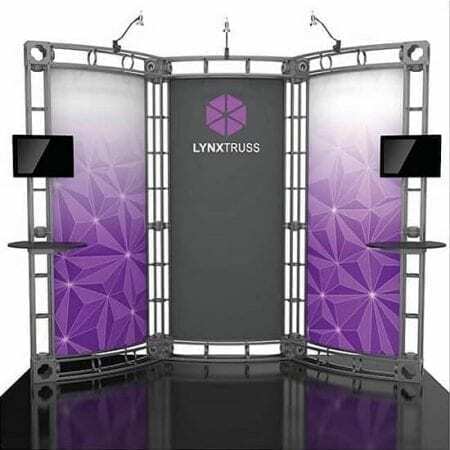 Therefore, unless constricted by space or other limitations, linear booths are 10′ deep, i.e. 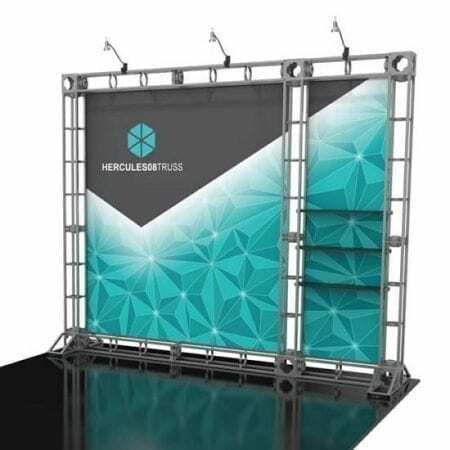 10’x10′. 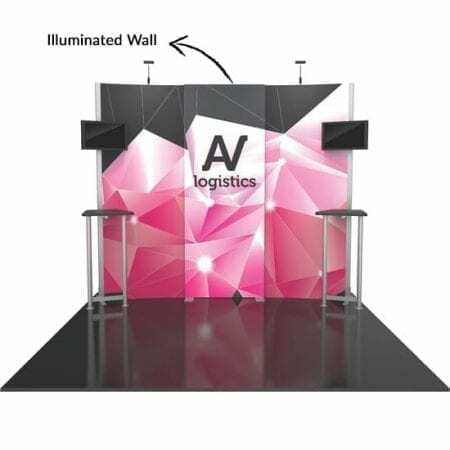 A maximum back wall height limitation of 8′ is allowed. 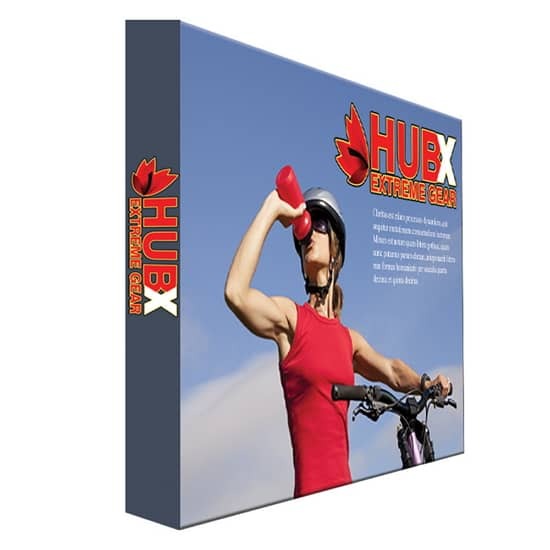 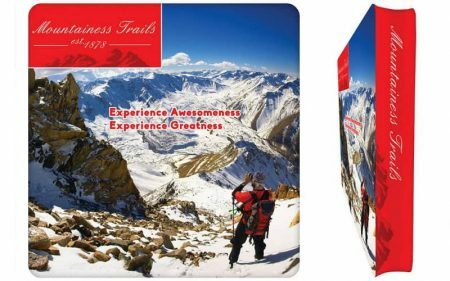 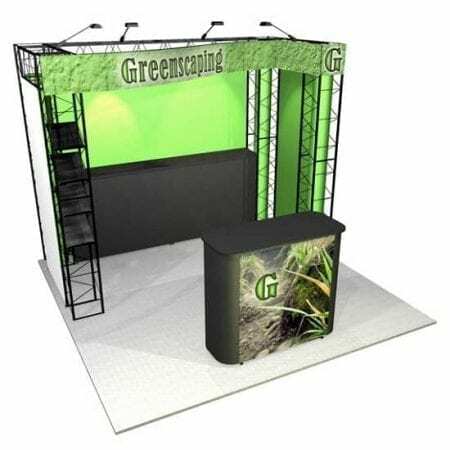 These generic 10′ x 10′ Trade Show Booth Rules are based on rules common to US convention centers and are intended as guidelines only. 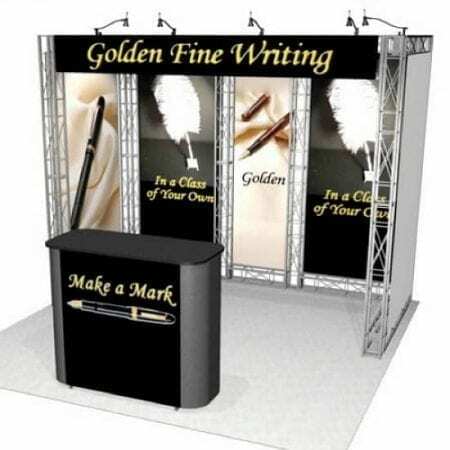 Exhibitors should always carefully review the information included in the exhibitor’s manual for their specific venue or event. 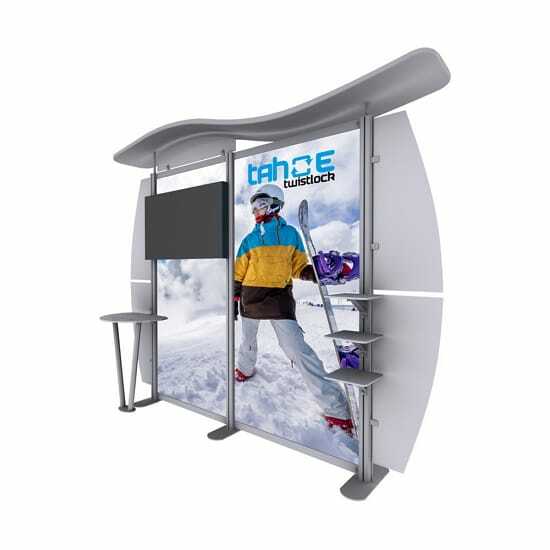 Equipment and product being displayed should not be placed in the booth in a manner which obstructs other exhibitors’ displays. 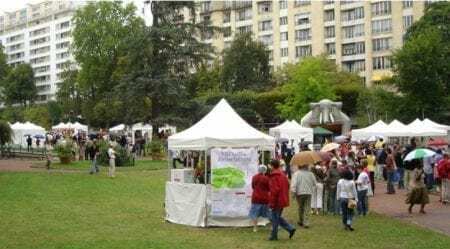 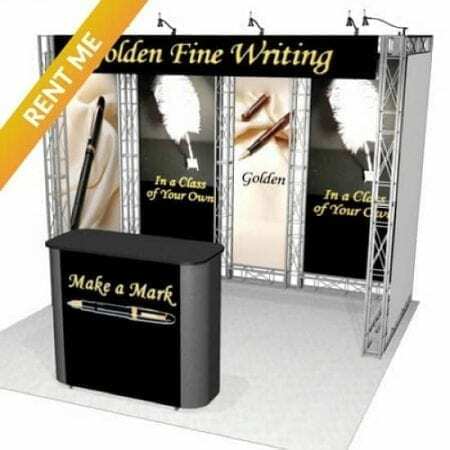 Any equipment or product scheduled for exhibition, which could possibly cause a conflict or infraction, should be cleared and approved prior to your show date. 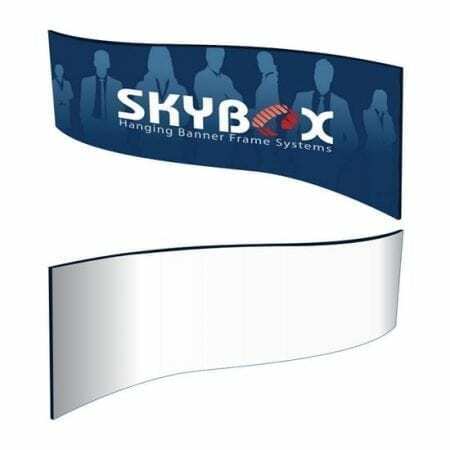 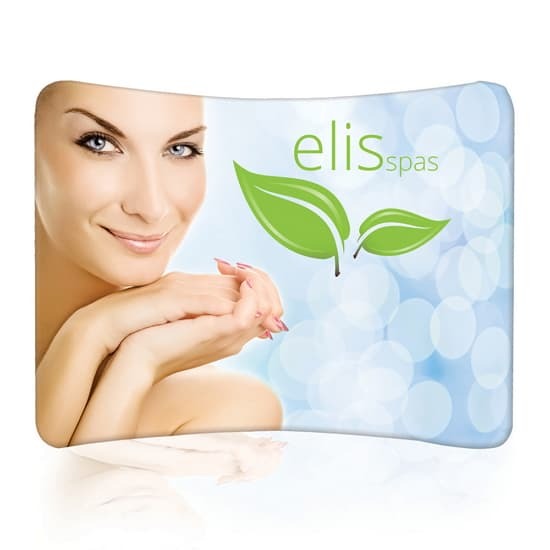 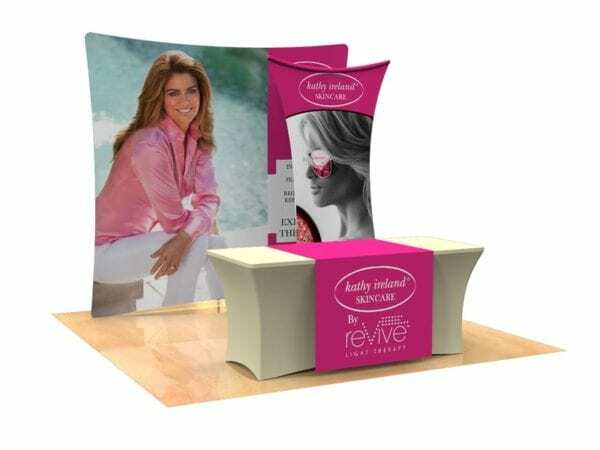 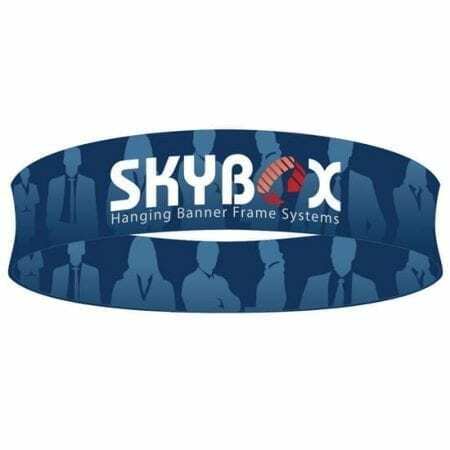 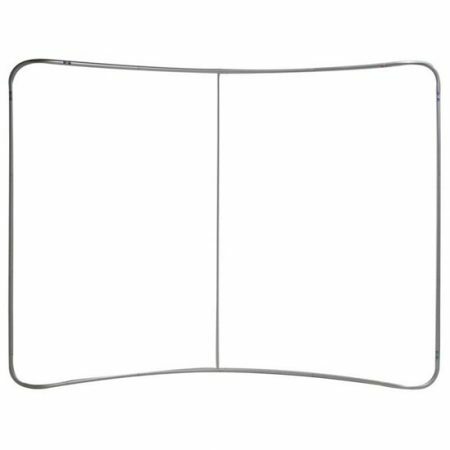 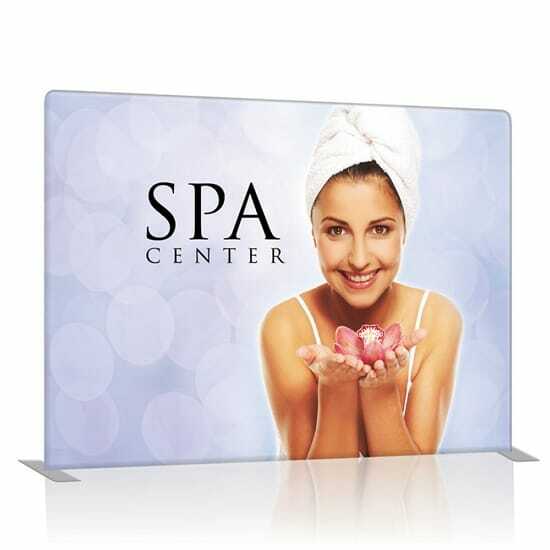 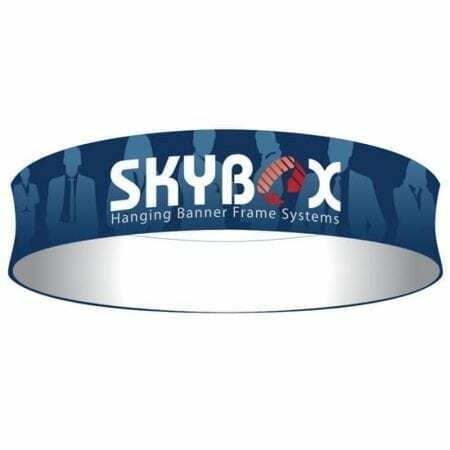 The price of an exhibit space generally includes back and side drape and a company identification sign. 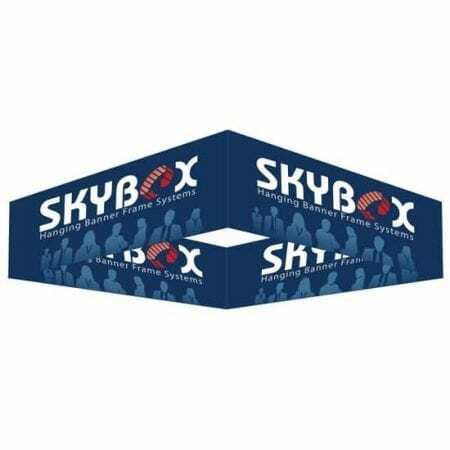 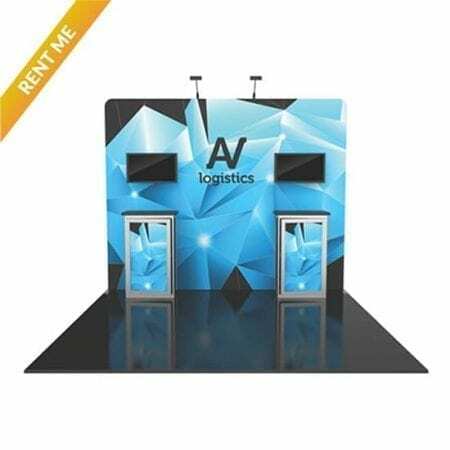 Exhibitors will usually not be permitted to purchase back-to-back booths and remove the separating back drape, but may be permitted to purchase multiple booths in a row and remove the separating side rails. 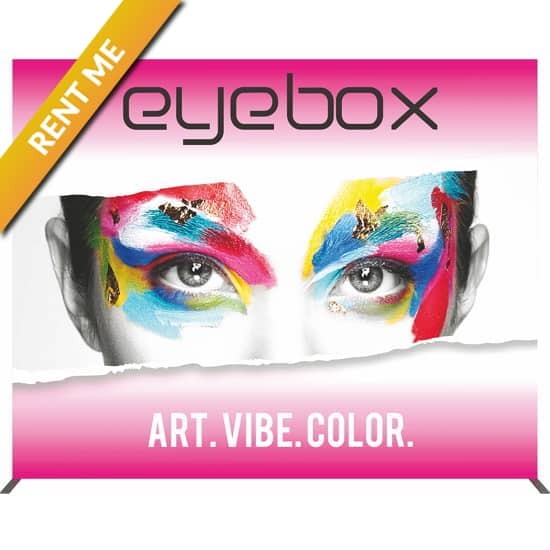 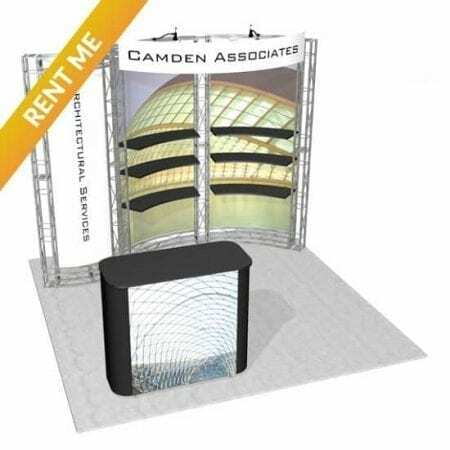 Extended height may be purchased for your space for an additional fee. 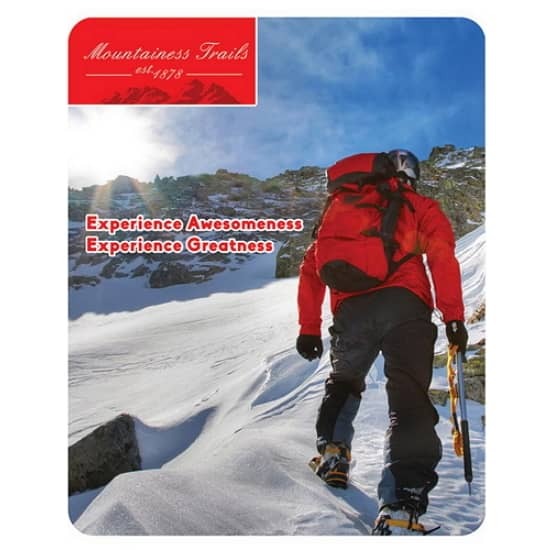 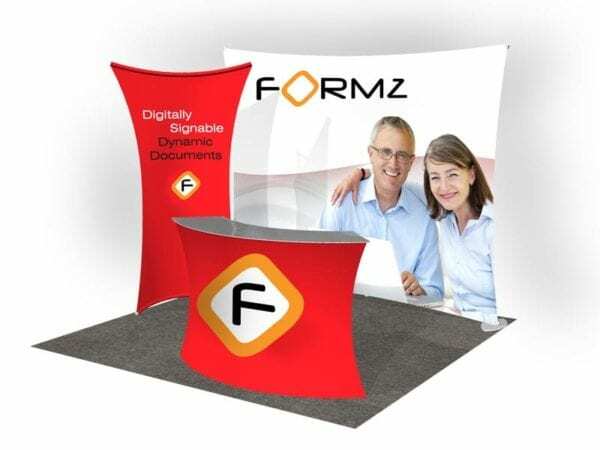 Should your booth exceed the standard exhibit height and back up to another exhibitor’s booth, you must “finish” the portion of your booth that extends beyond the standard exhibit height. 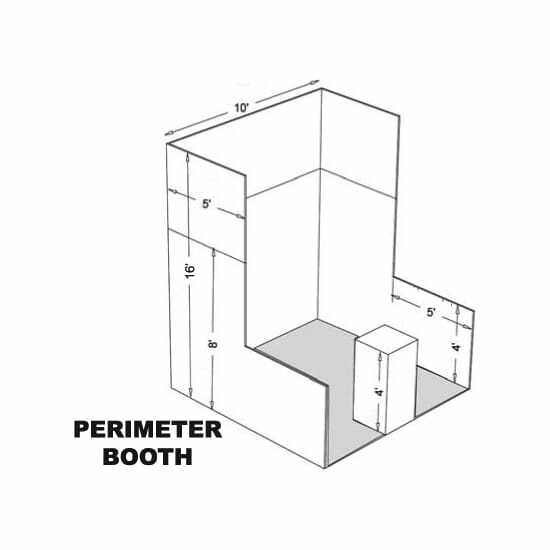 You may be charged for adjustments made to unfinished portions of your booth in order to comply with this regulation. 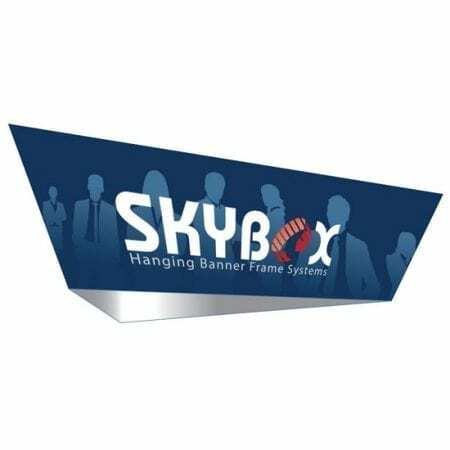 Separate hanging sign permission is usually required and may incur an additional fee. 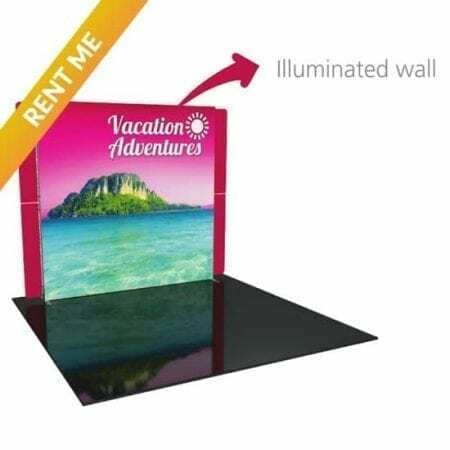 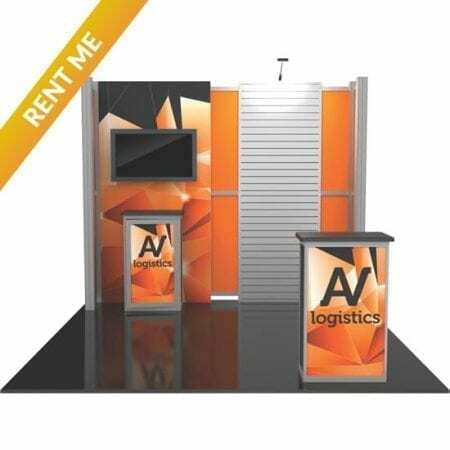 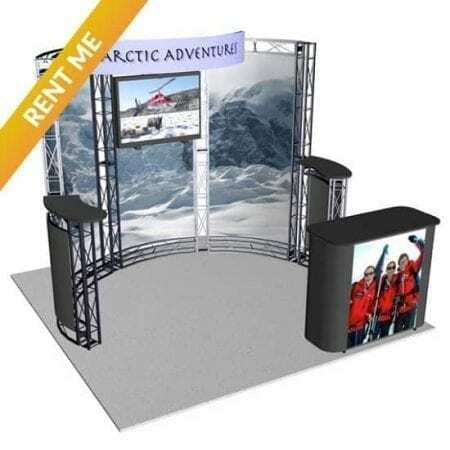 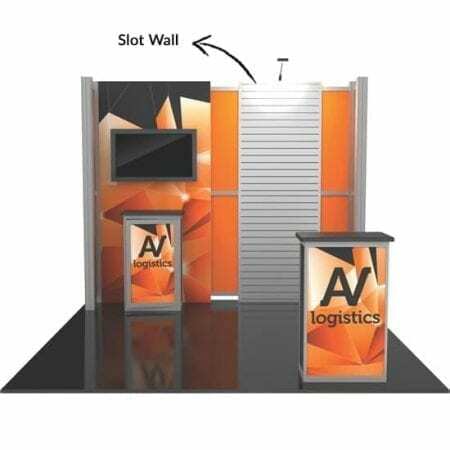 Hanging signs are typically only allowed certain booth configurations, such as island and peninsula booths. 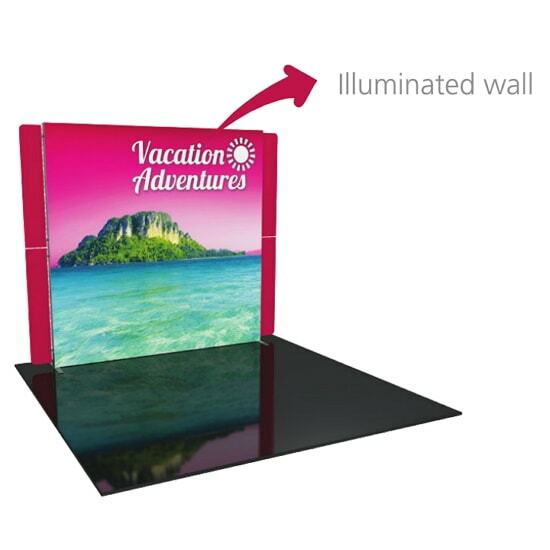 Height is measured from the floor to the top of the hanging display and is subject to restrictions. 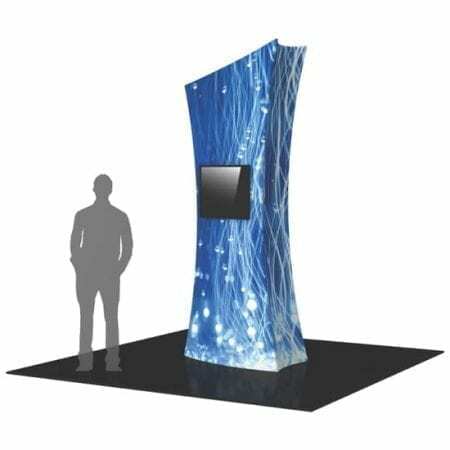 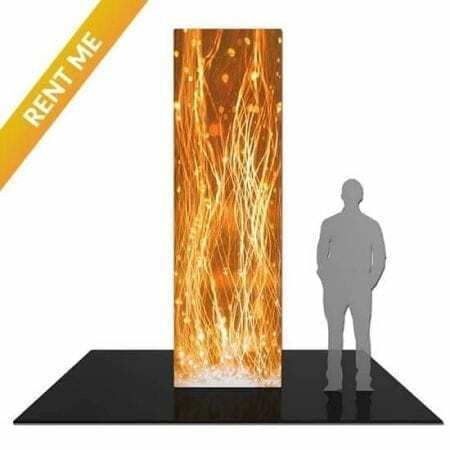 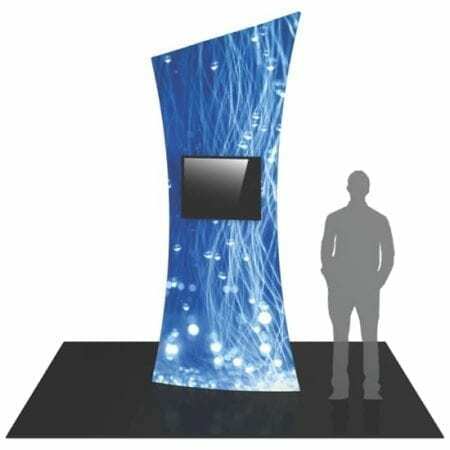 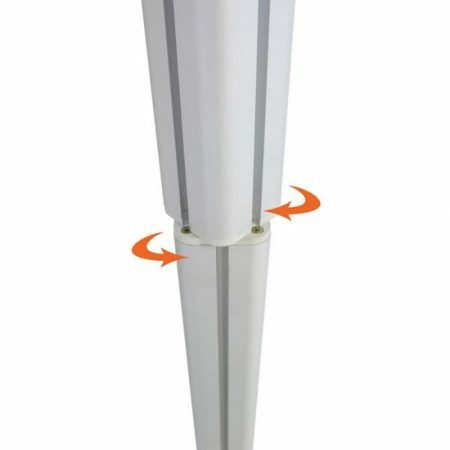 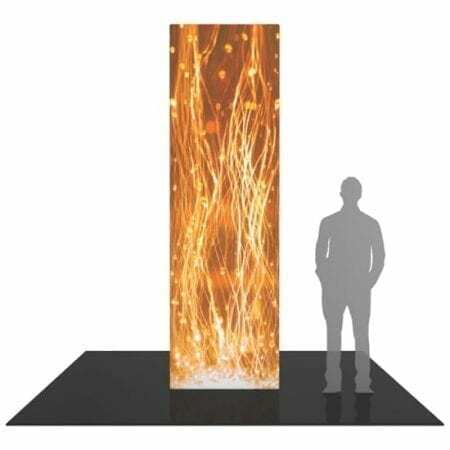 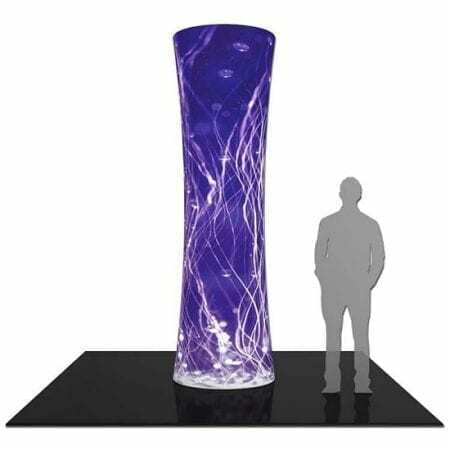 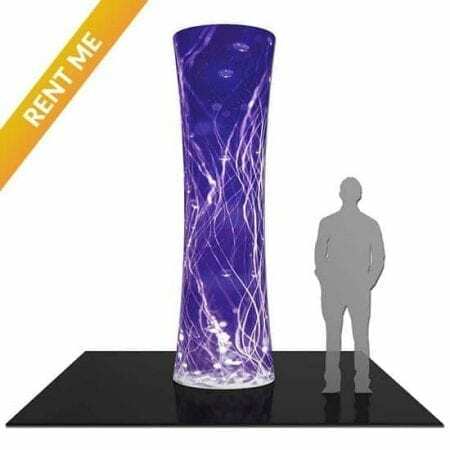 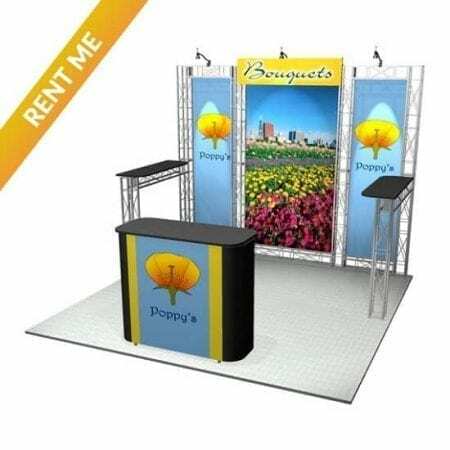 A tower is a freestanding exhibit component separate from the main exhibit fixture that is used for identification display purposes only. 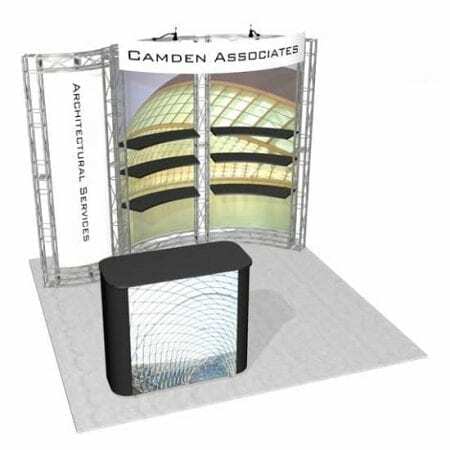 Towers are subject to the same height restriction as applies to the rest of the booth configuration being used. 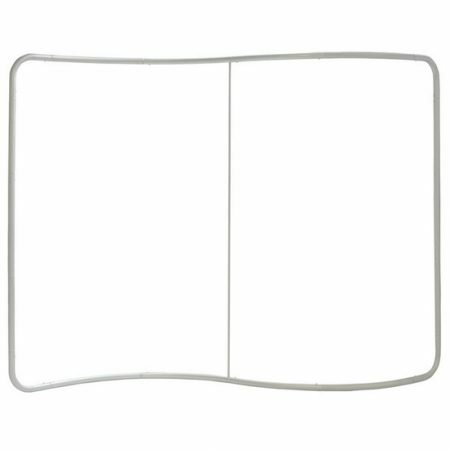 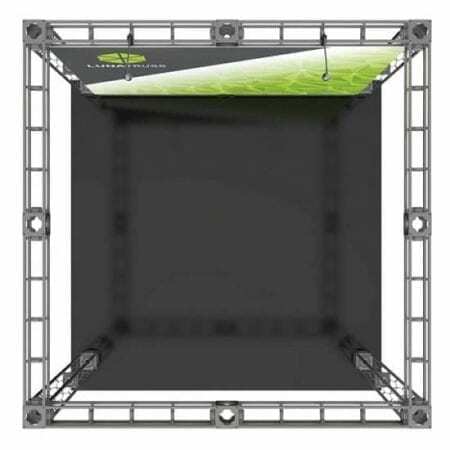 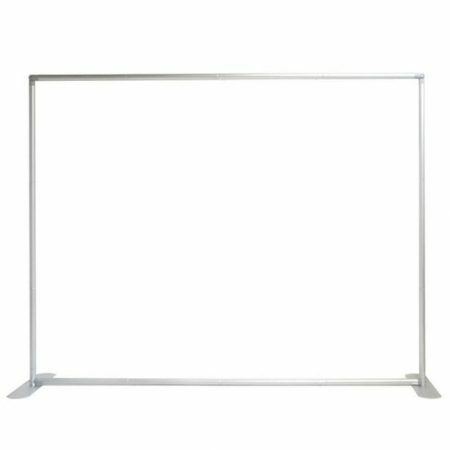 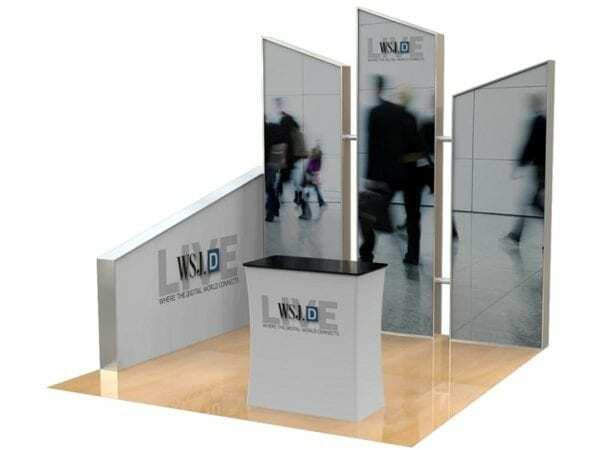 Standard Linear In-Line 10′ x 10′ Booth: Linear booths have one side exposed to an aisle and are generally arranged in a series along a straight line. 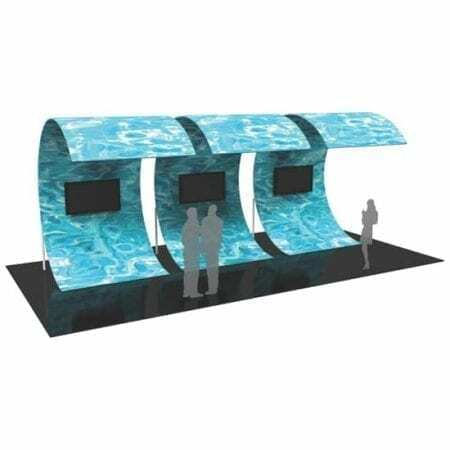 They are also called “in-line” booths. 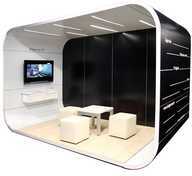 This configuration also includes corner booths and perimeter booths. 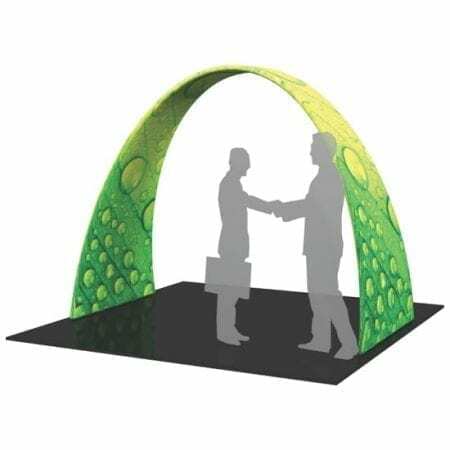 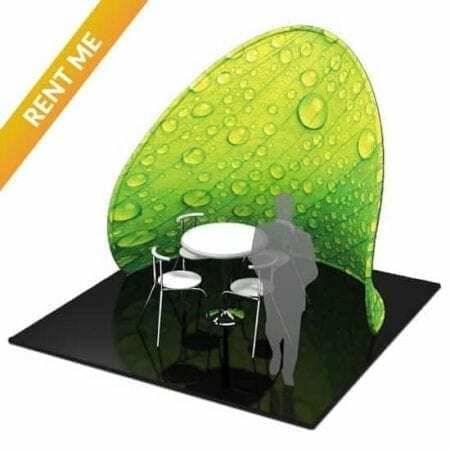 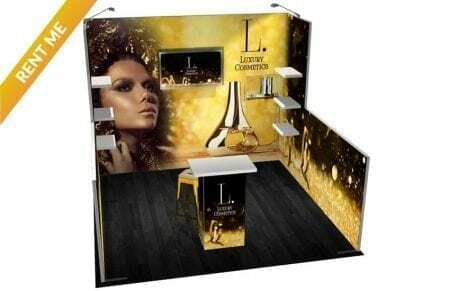 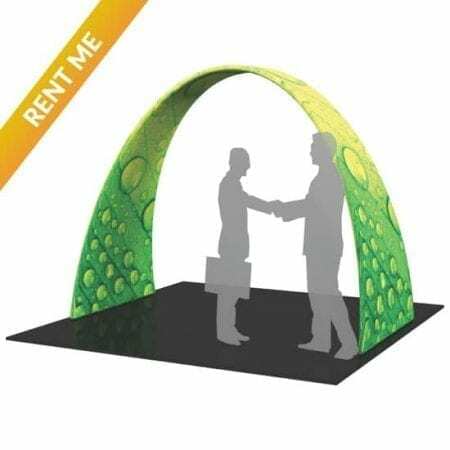 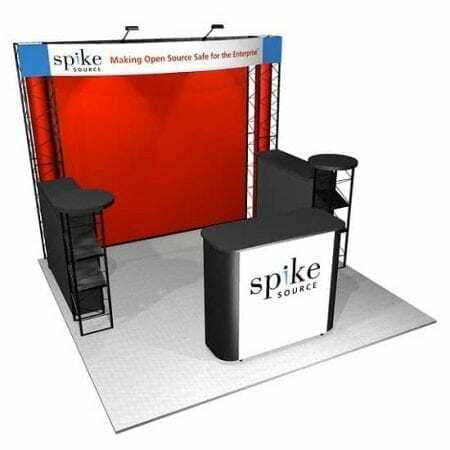 Corner Trade Show Booth: A corner booth is a booth exposed to an aisle on two sides, or a booth without an adjacent exhibitor within 10′. 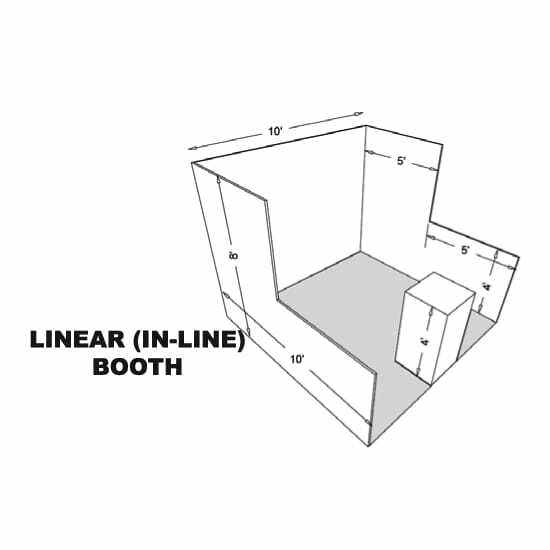 It needs to follow the same rules as the in-line 10’x10′ booth. 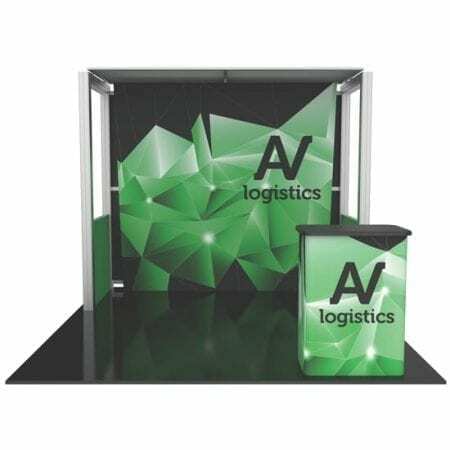 A 10’x10′ perimeter booth is a linear booth that backs up to a wall of the exhibit facility rather than to another exhibit. 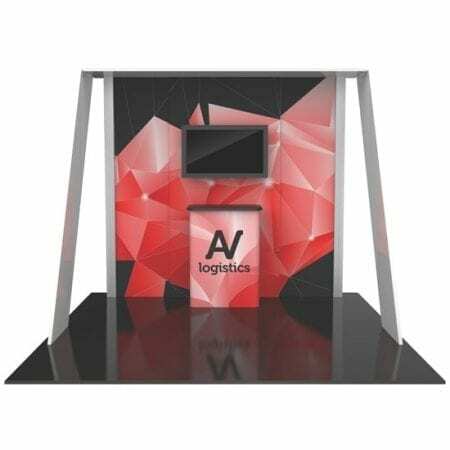 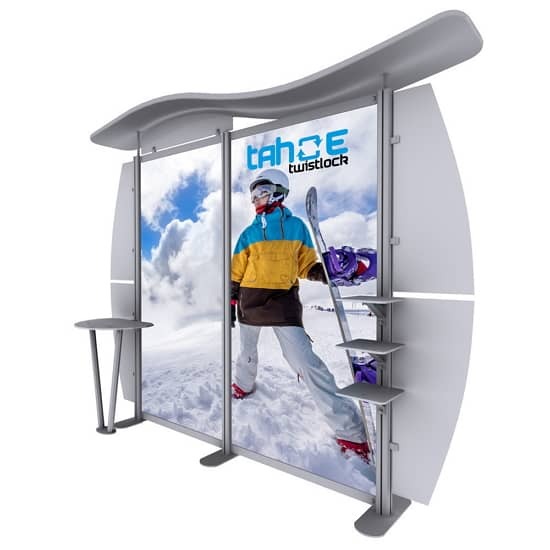 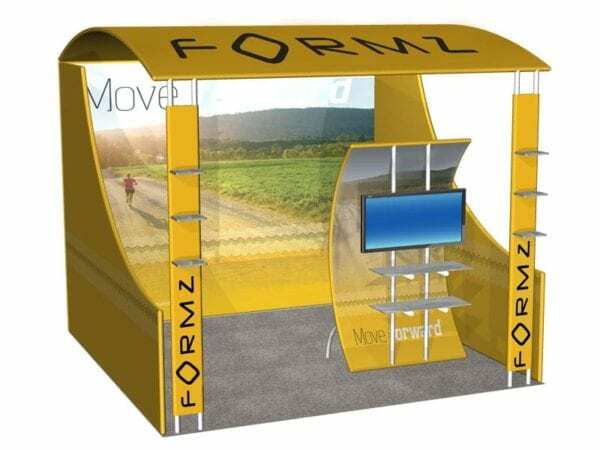 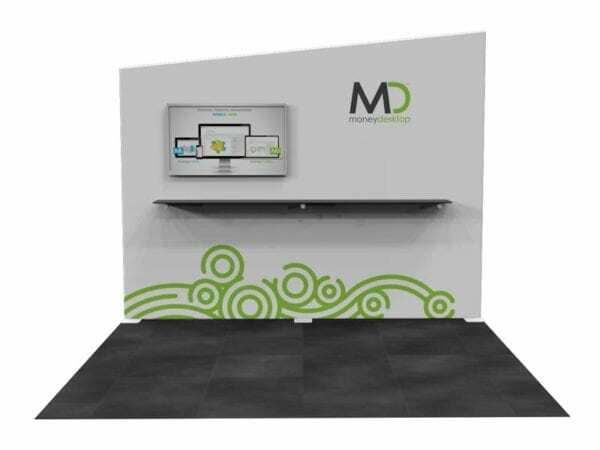 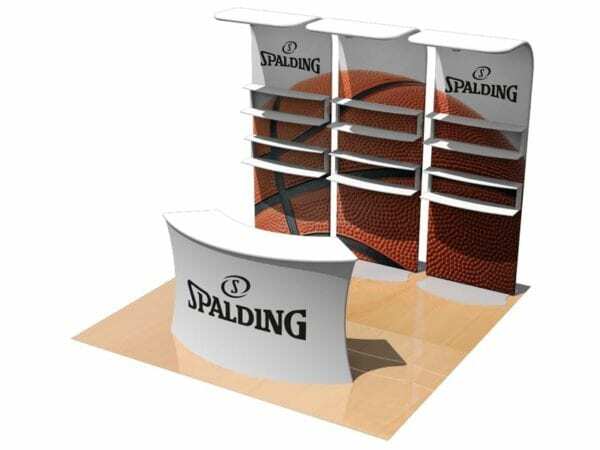 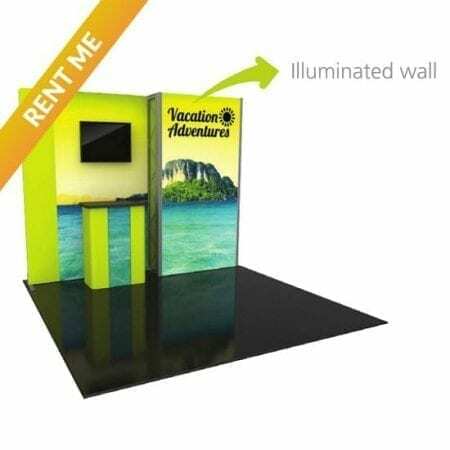 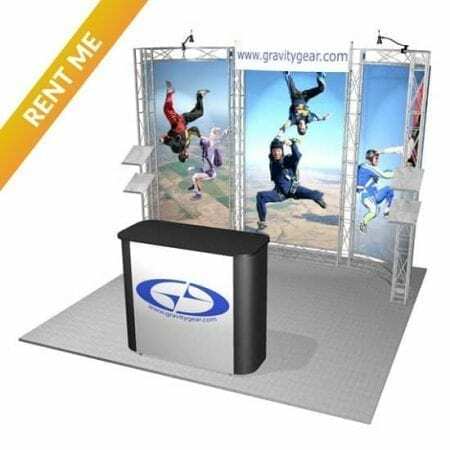 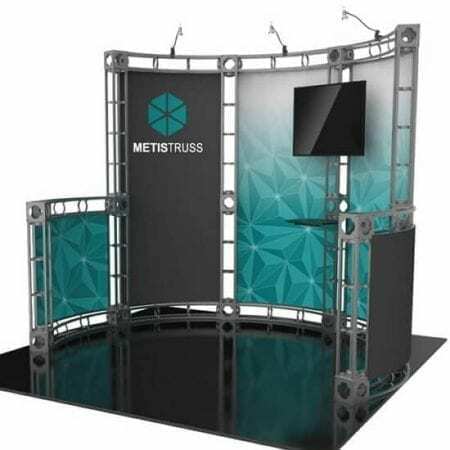 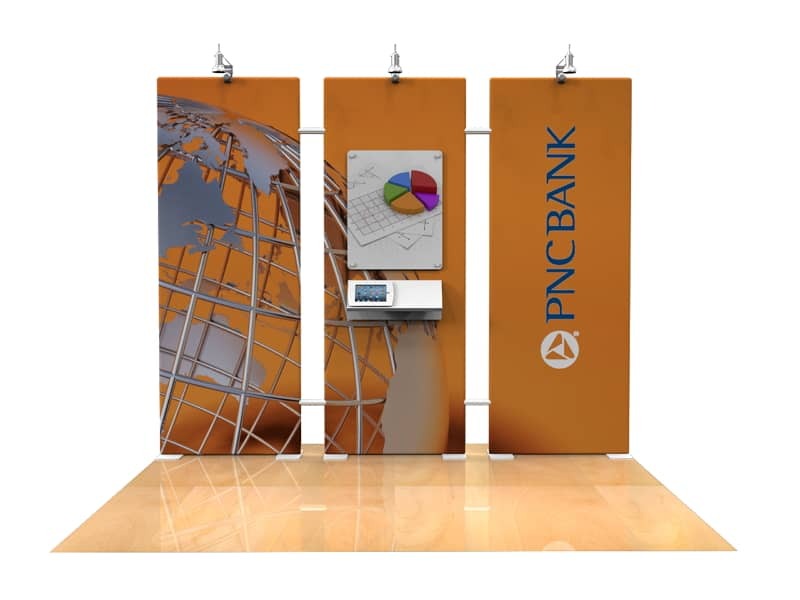 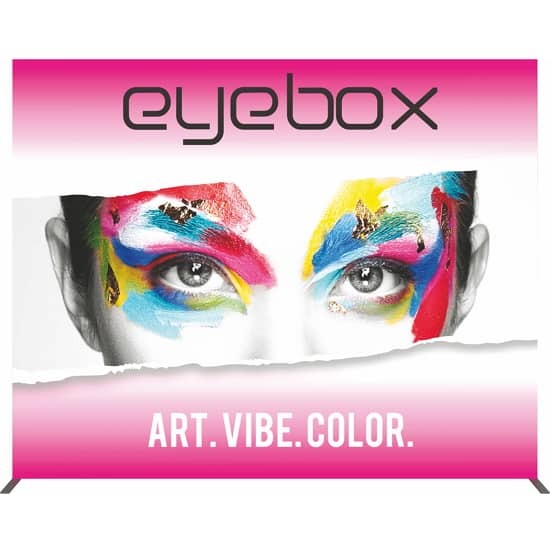 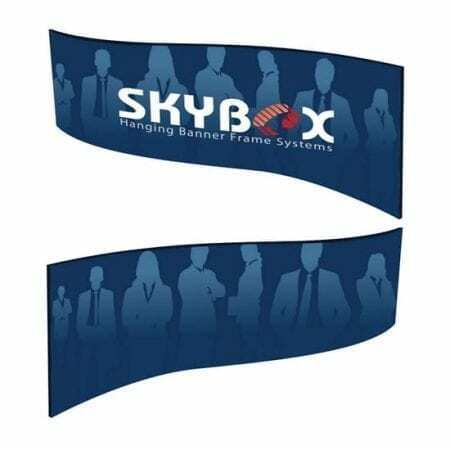 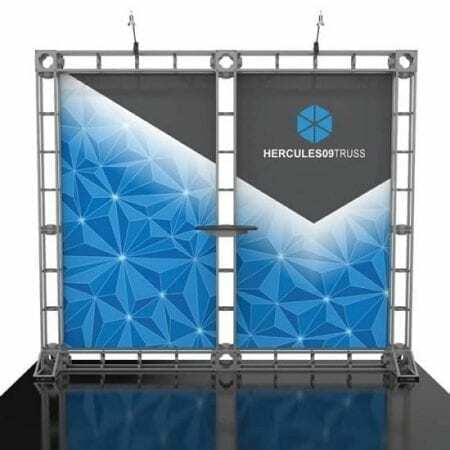 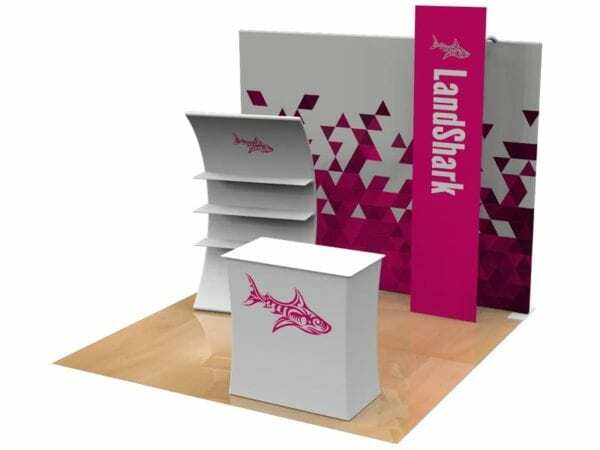 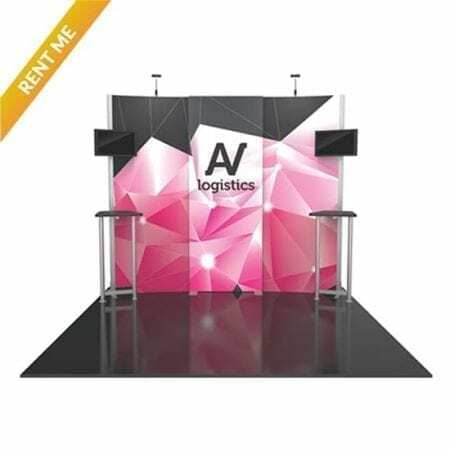 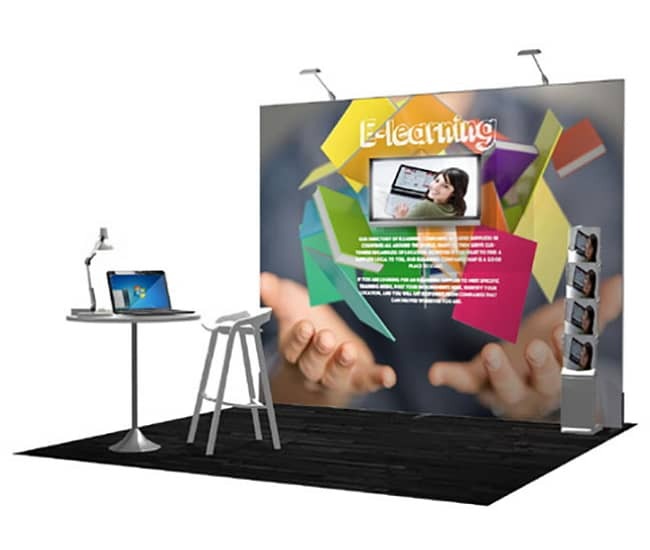 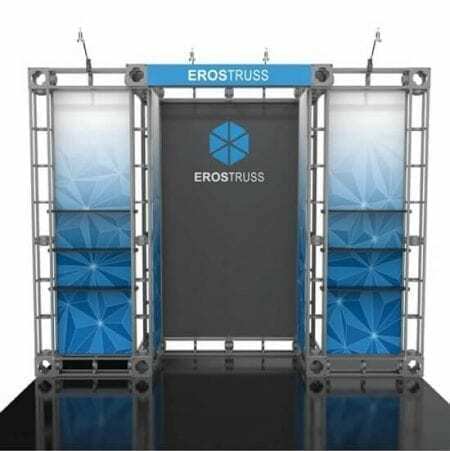 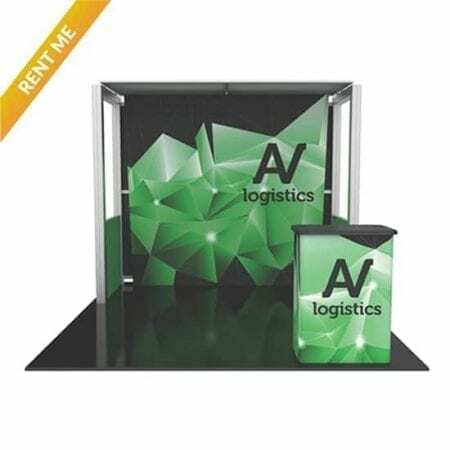 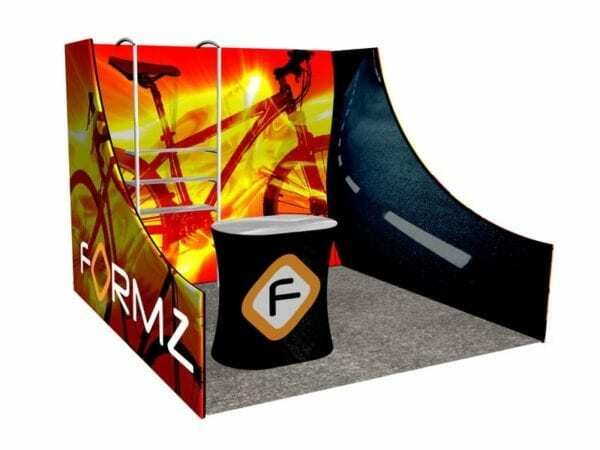 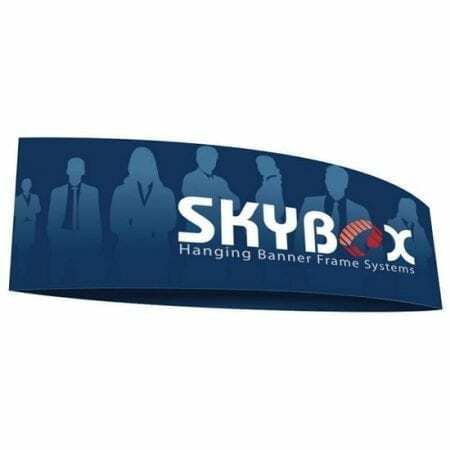 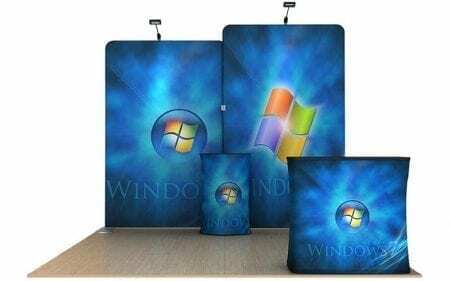 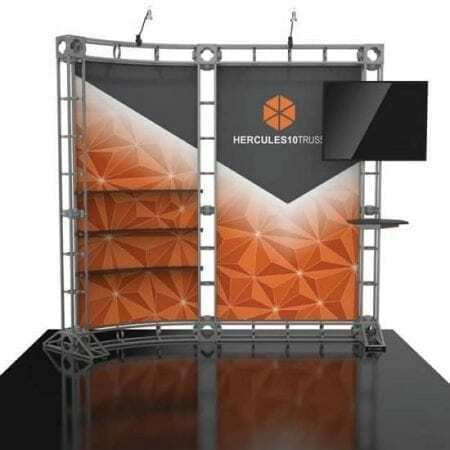 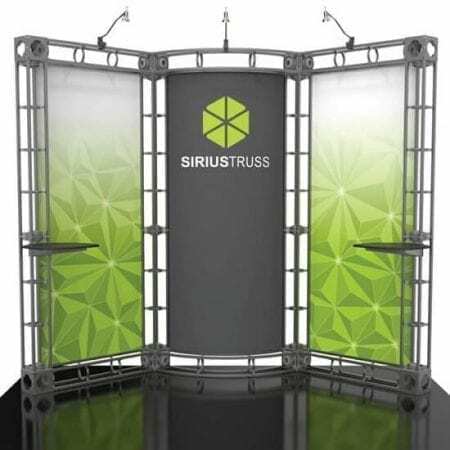 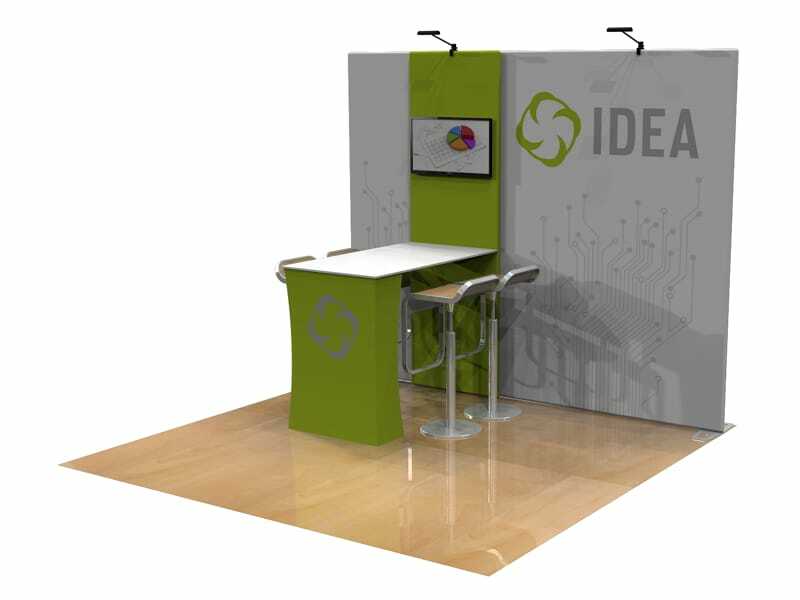 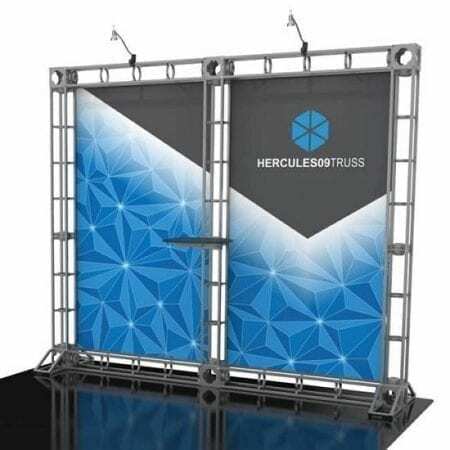 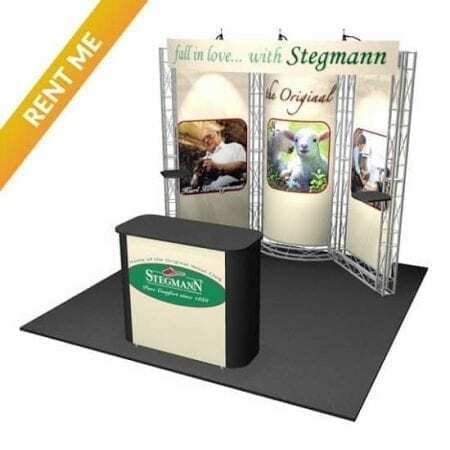 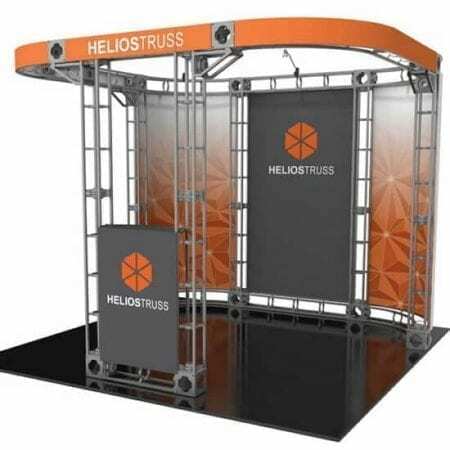 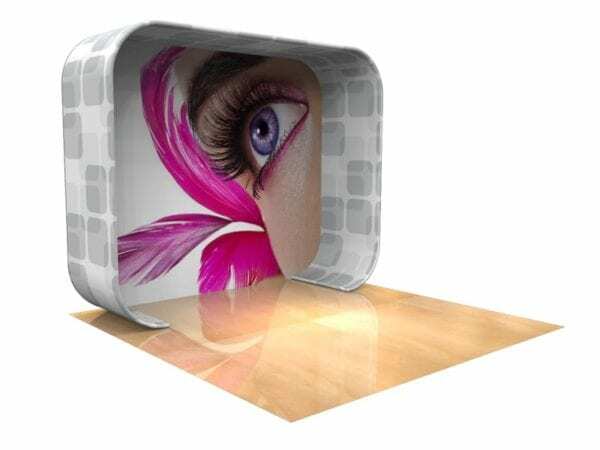 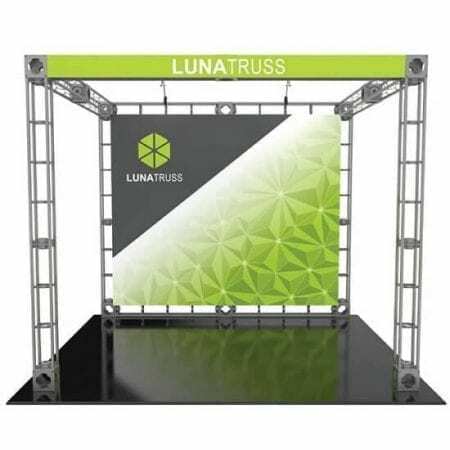 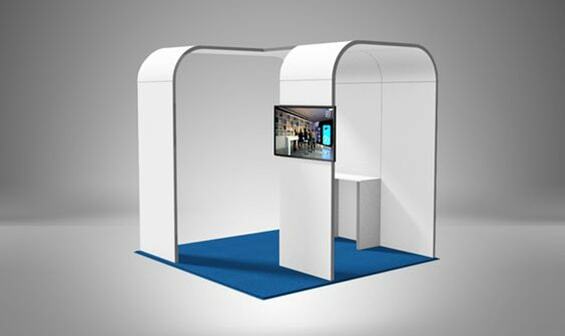 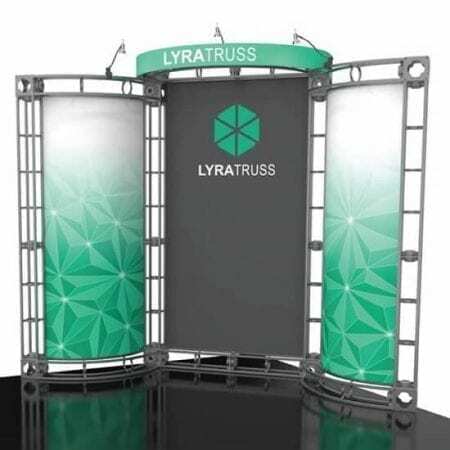 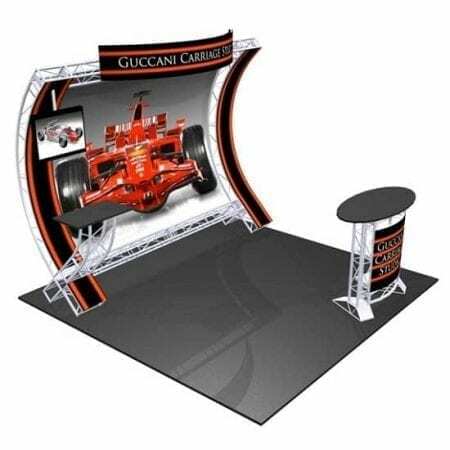 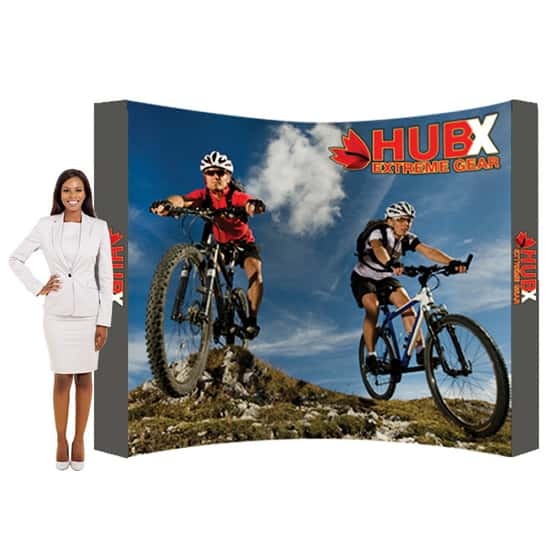 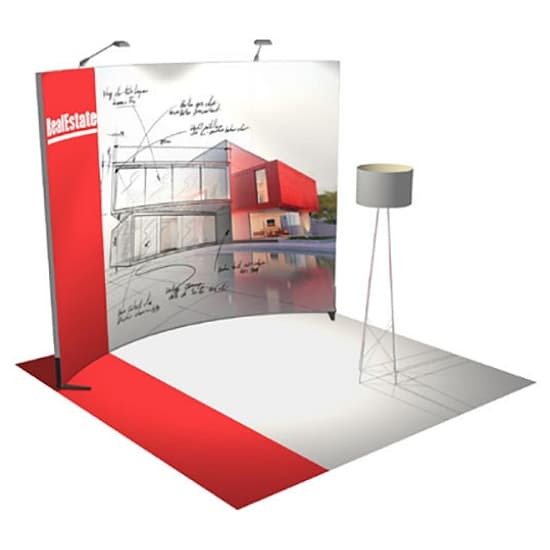 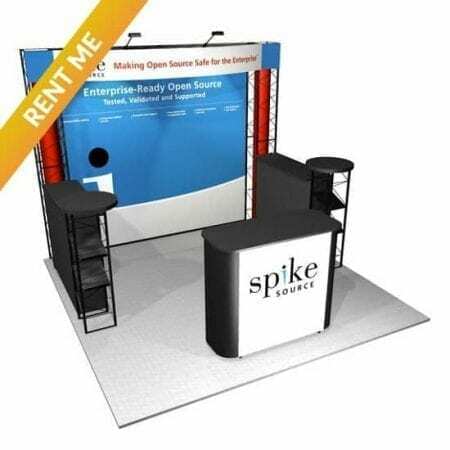 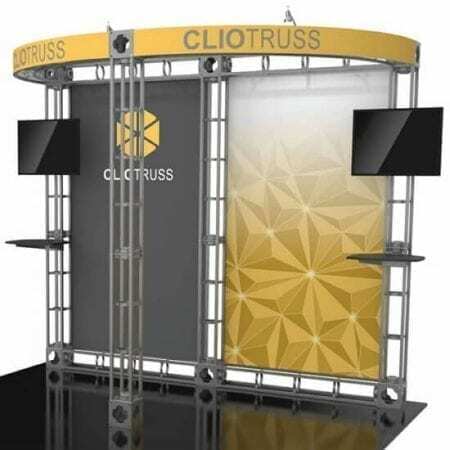 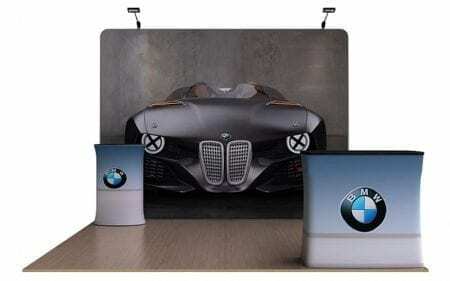 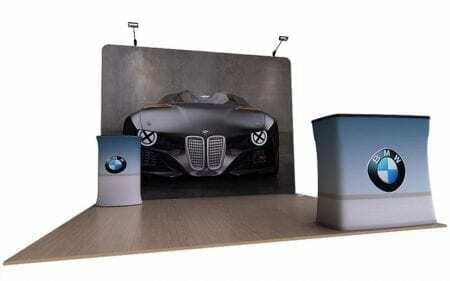 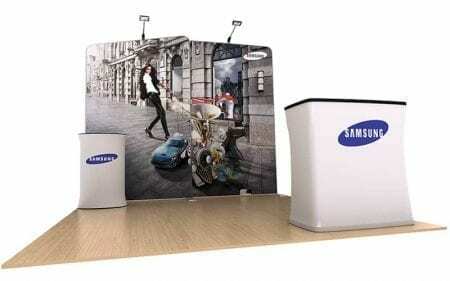 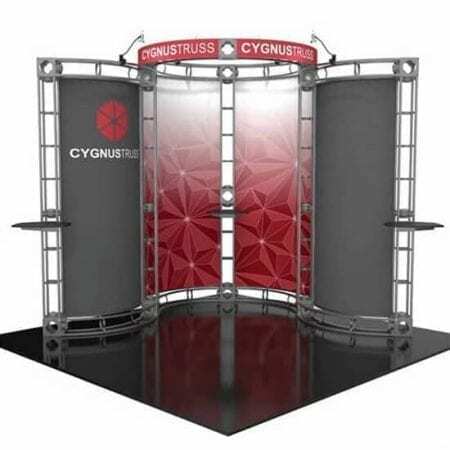 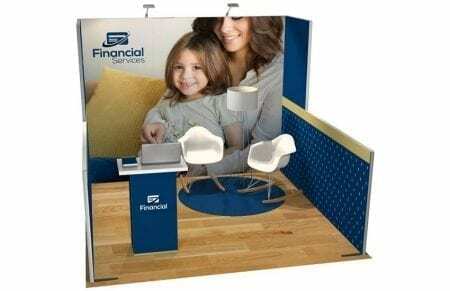 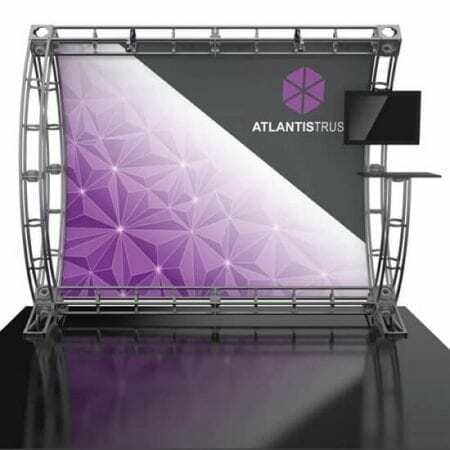 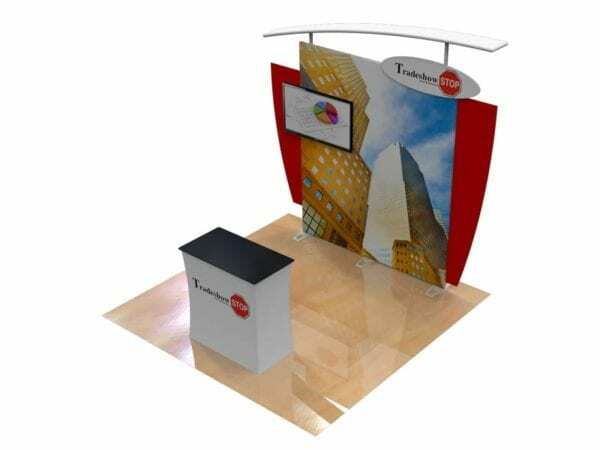 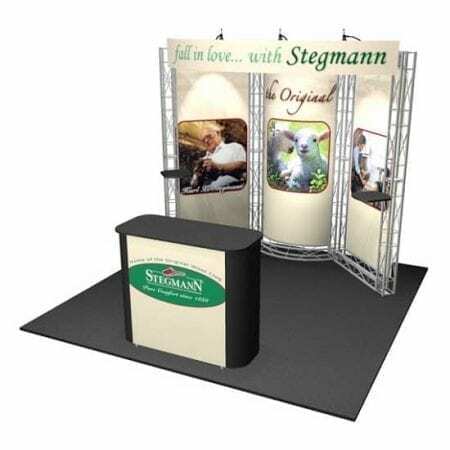 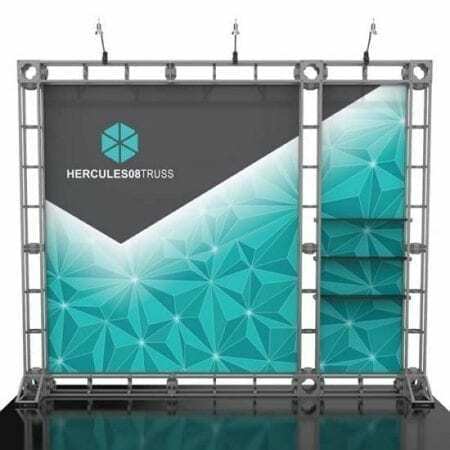 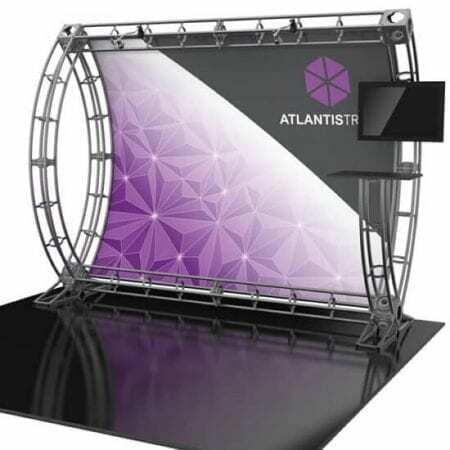 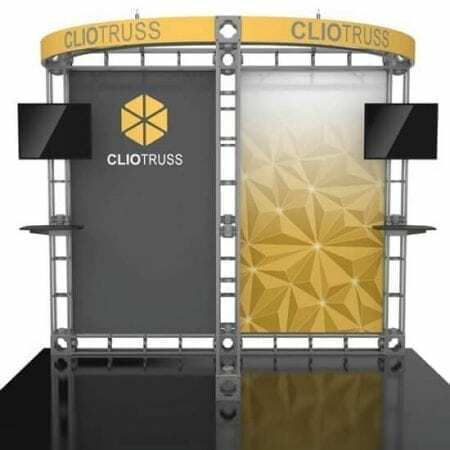 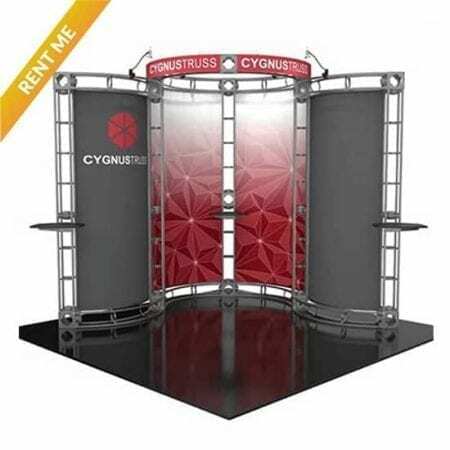 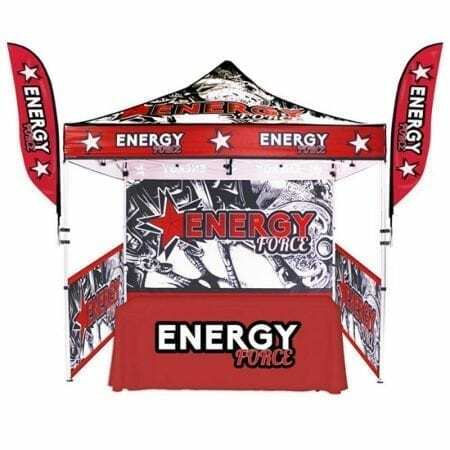 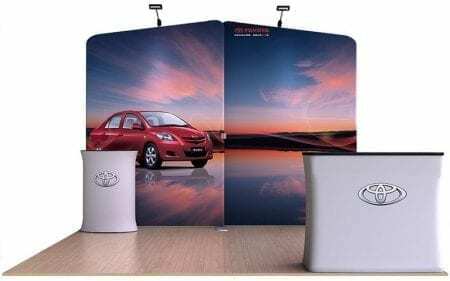 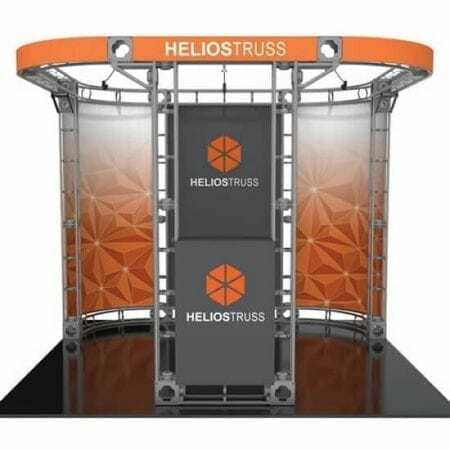 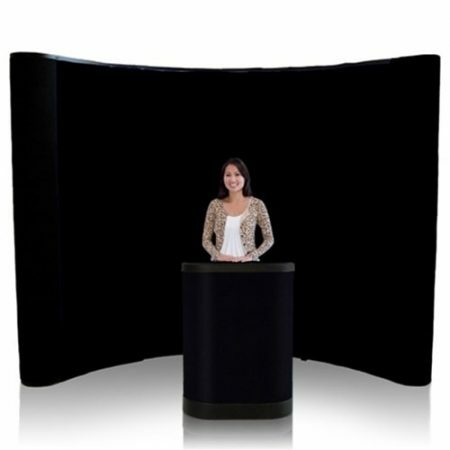 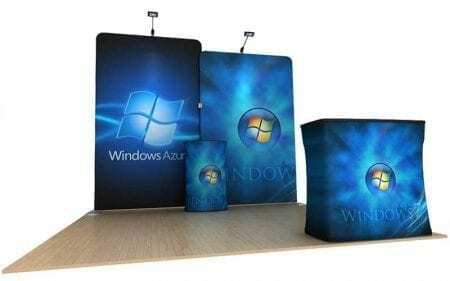 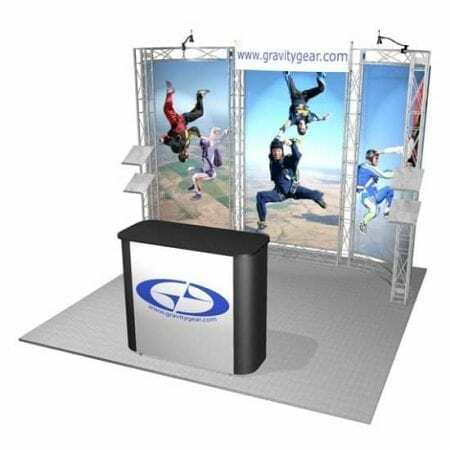 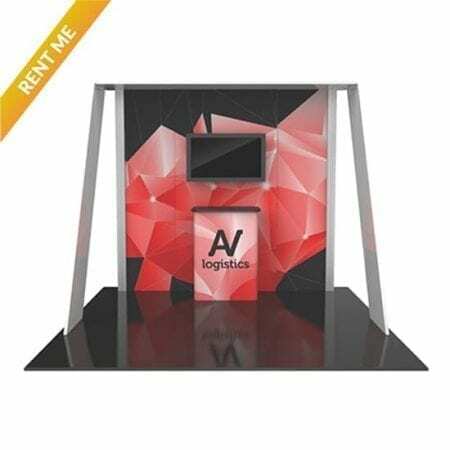 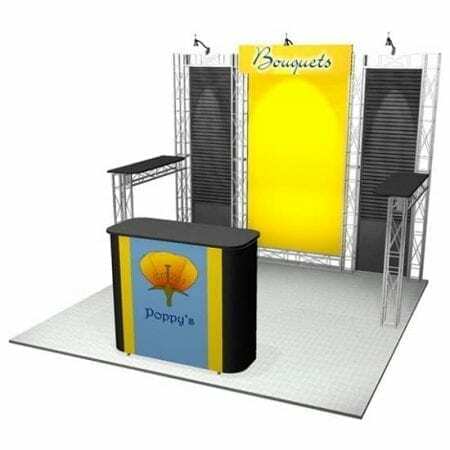 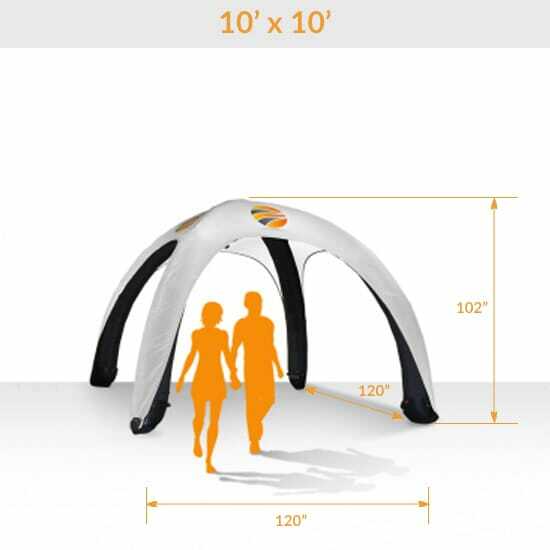 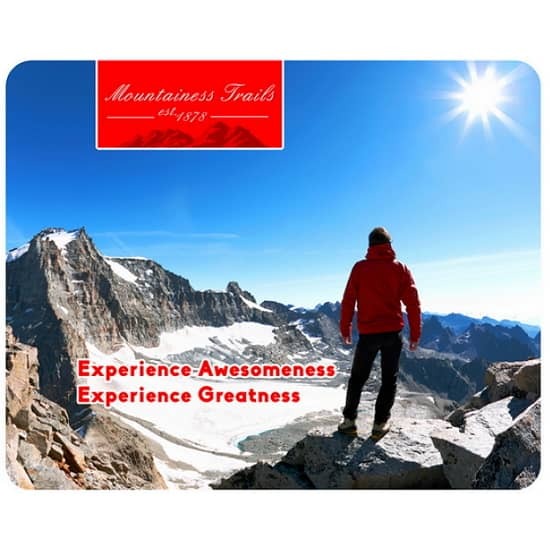 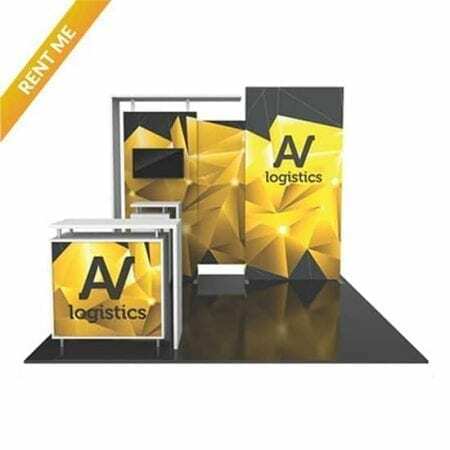 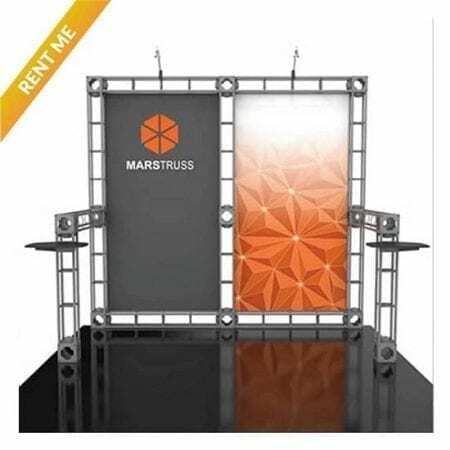 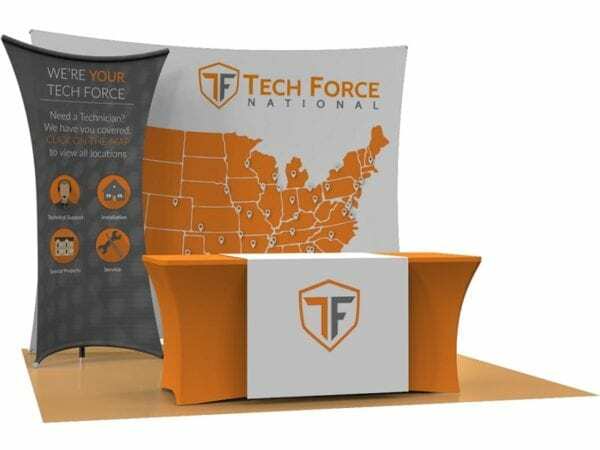 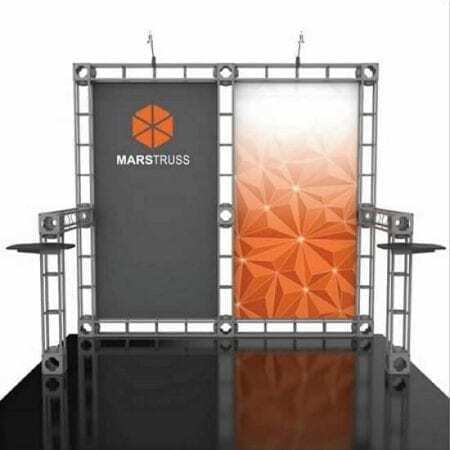 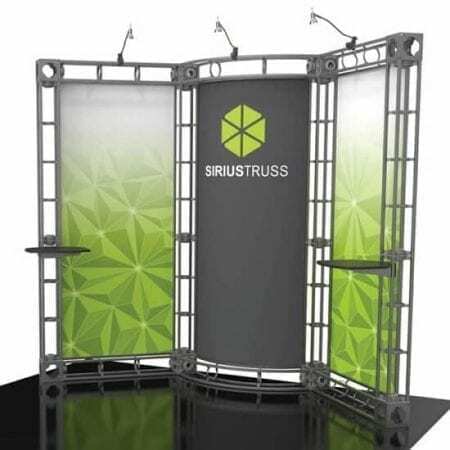 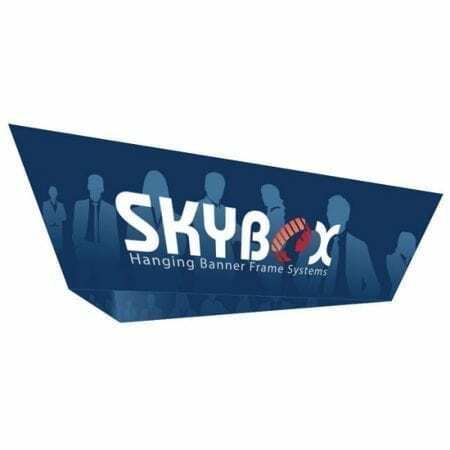 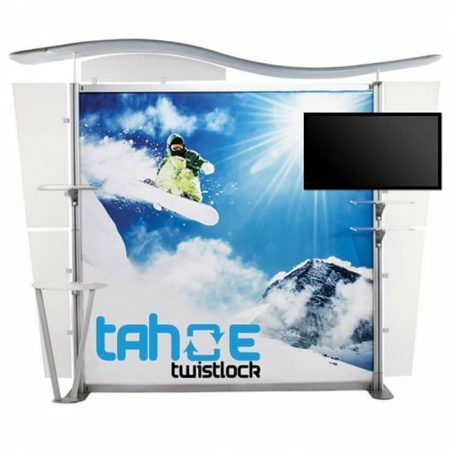 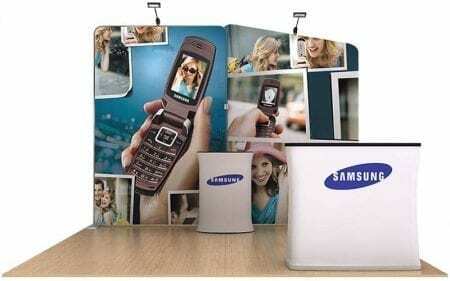 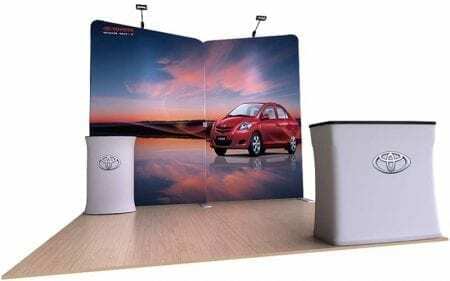 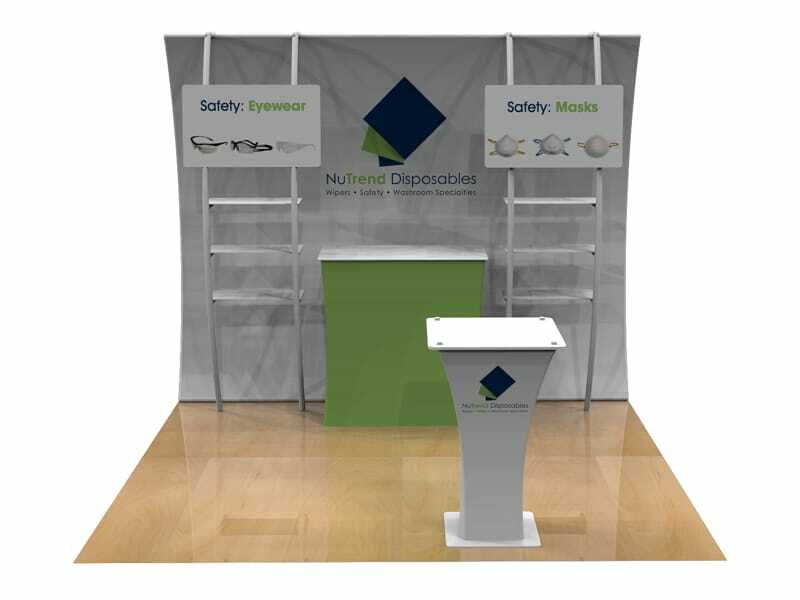 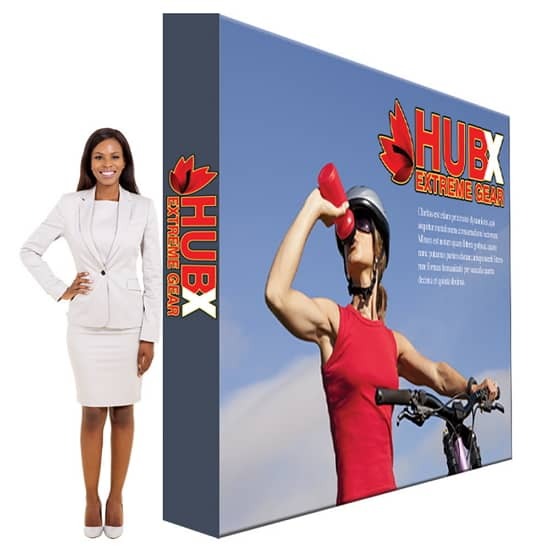 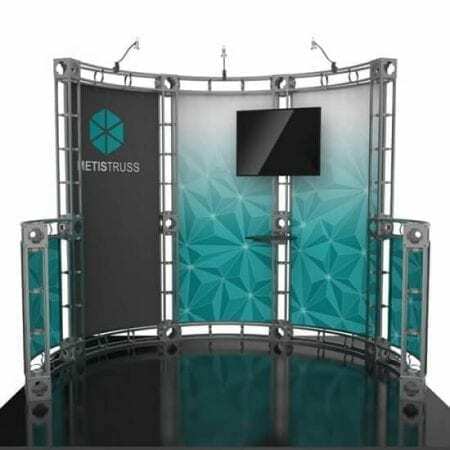 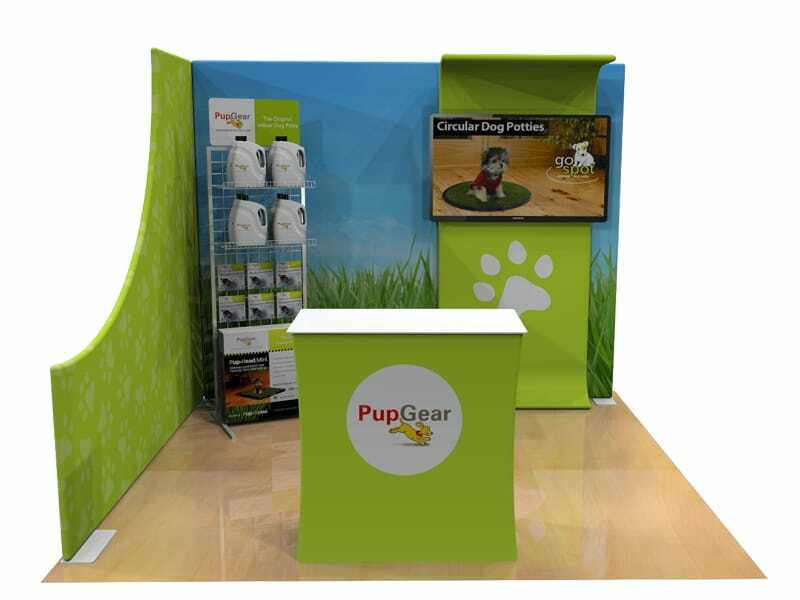 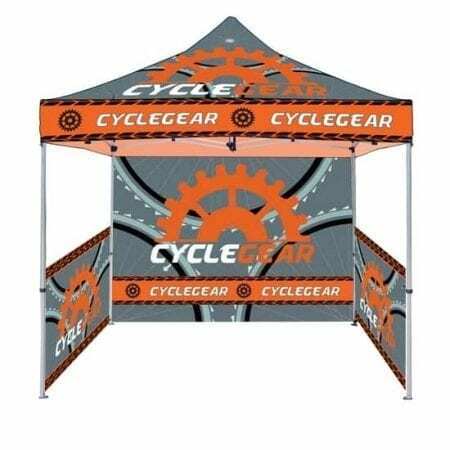 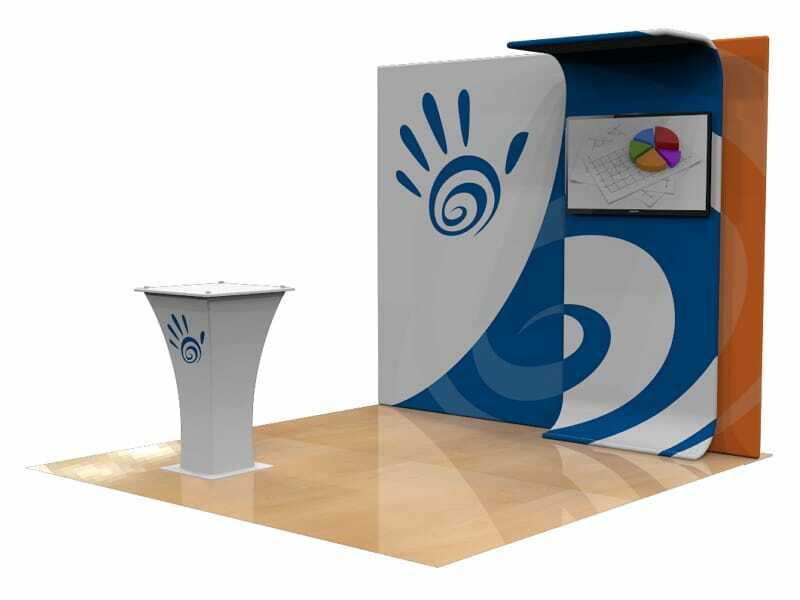 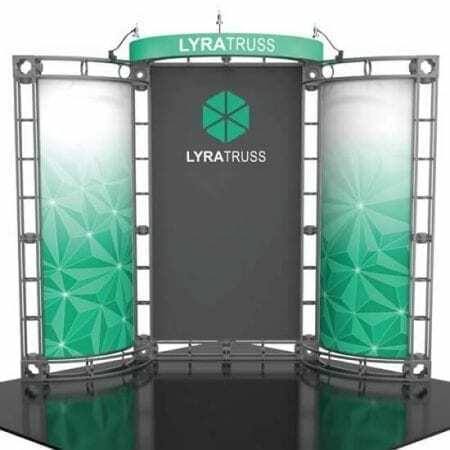 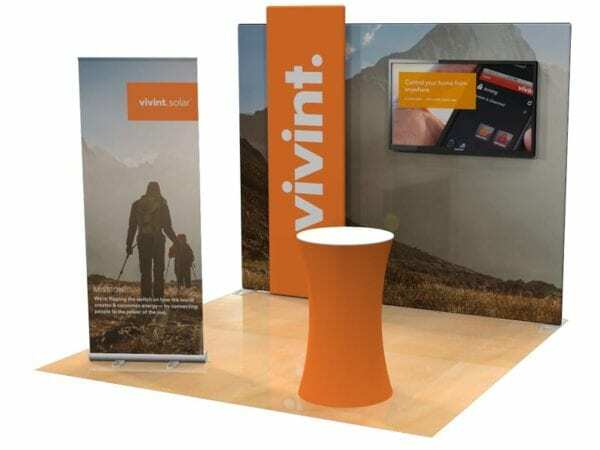 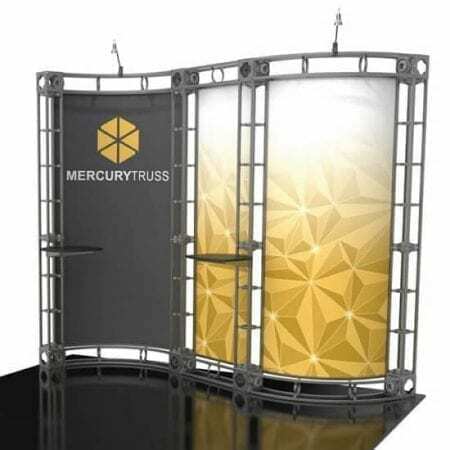 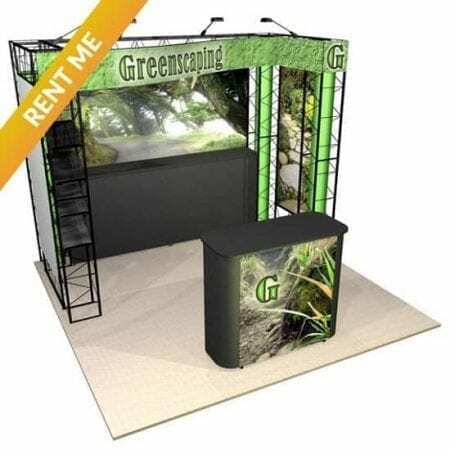 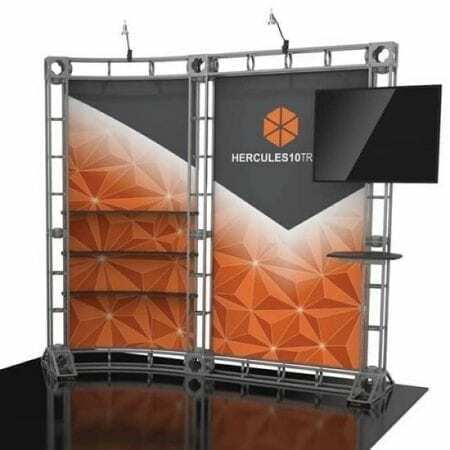 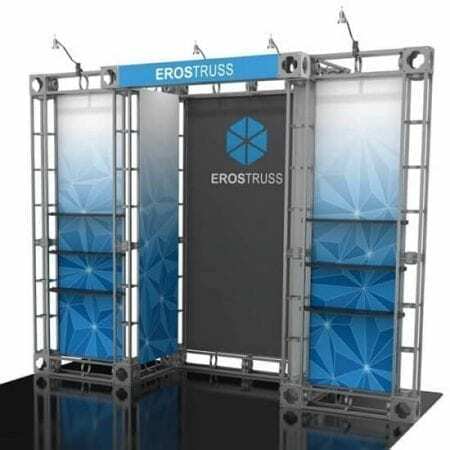 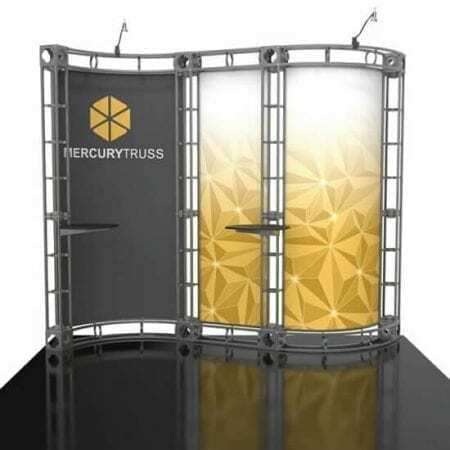 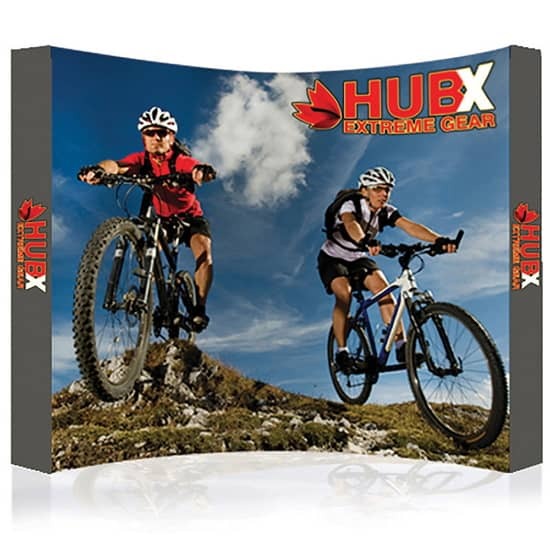 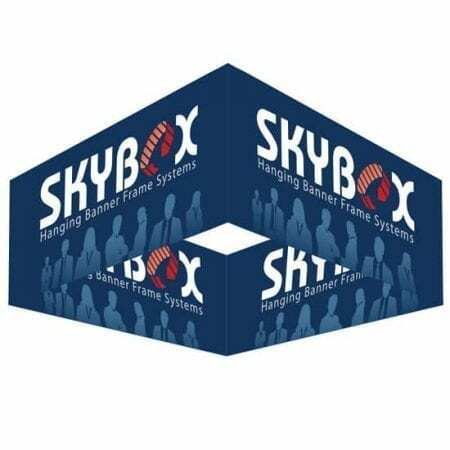 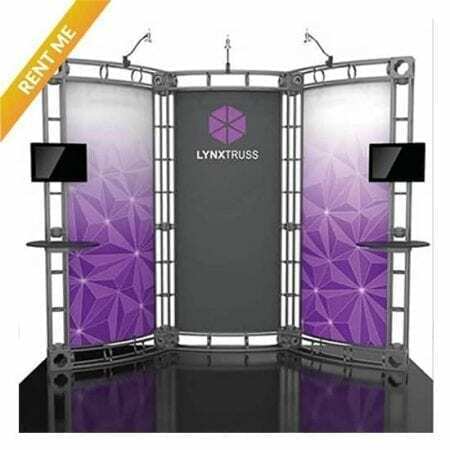 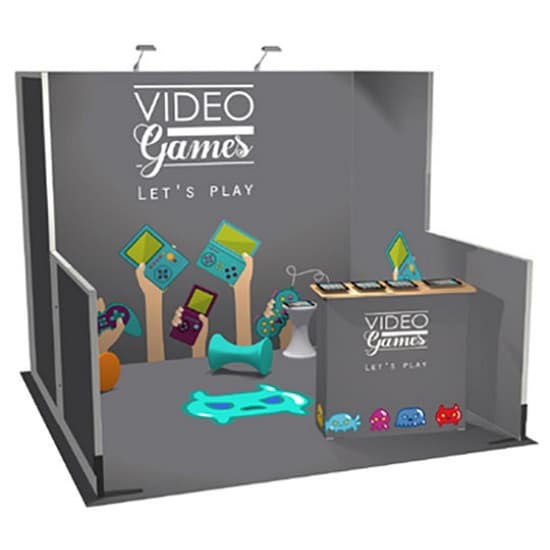 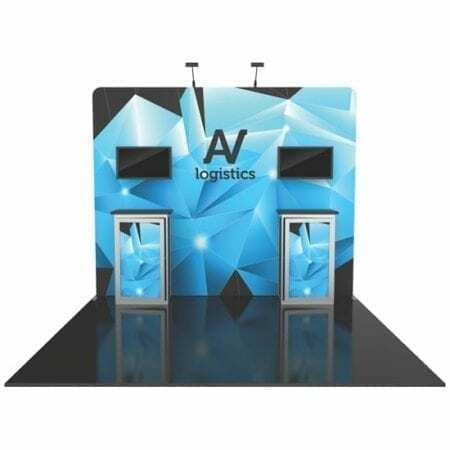 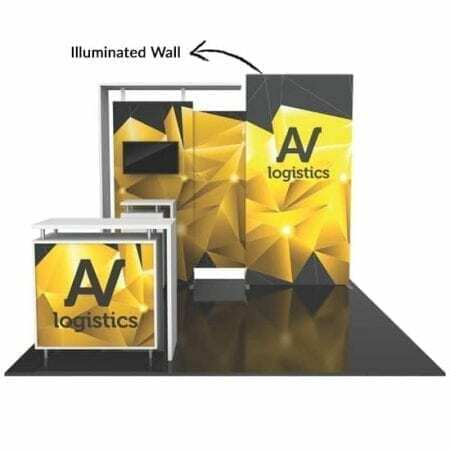 Unlike a standard in-line 10’x10′ trade show booth you are usually able to use taller backwall or structure (sometimes up to 16′ high depending on the exhibit hall). 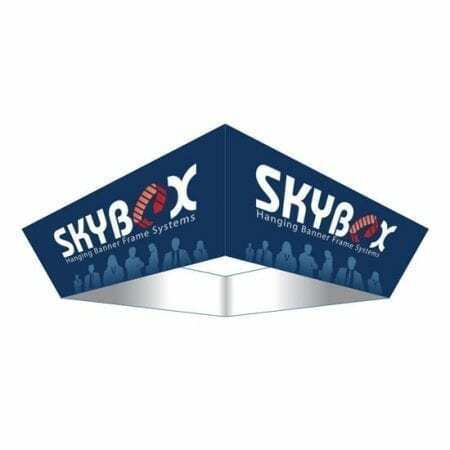 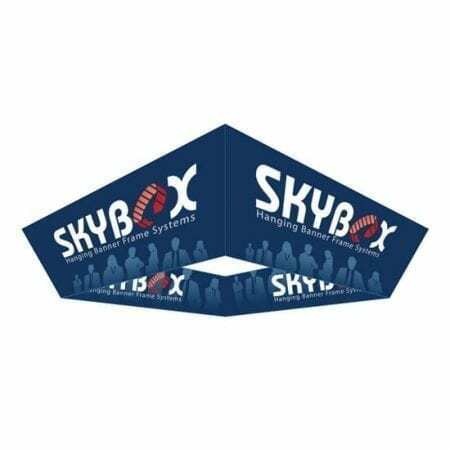 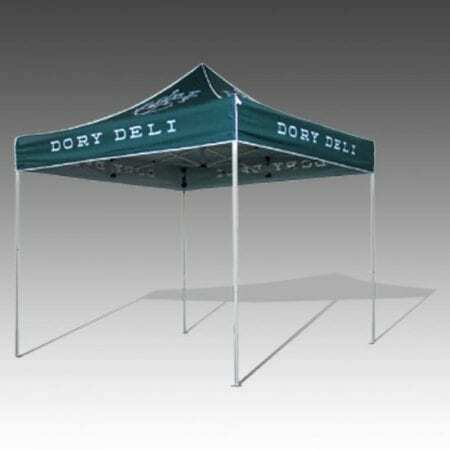 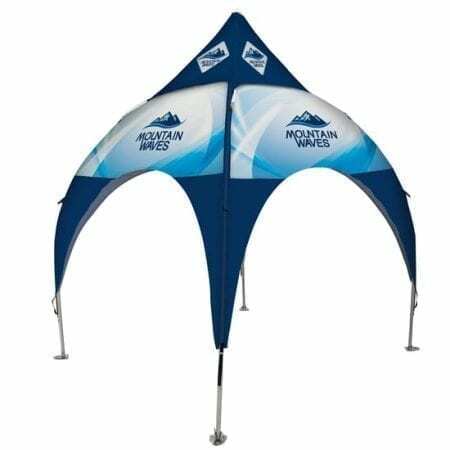 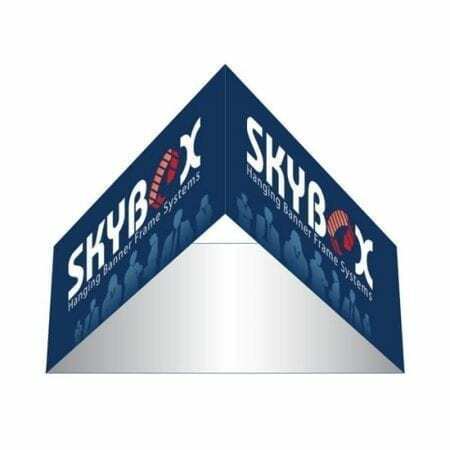 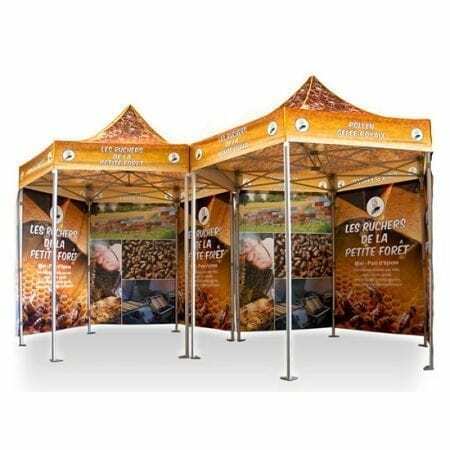 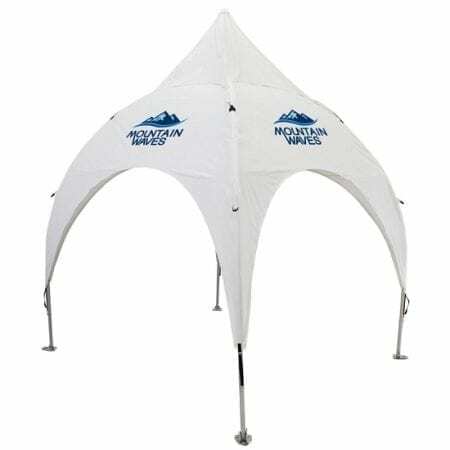 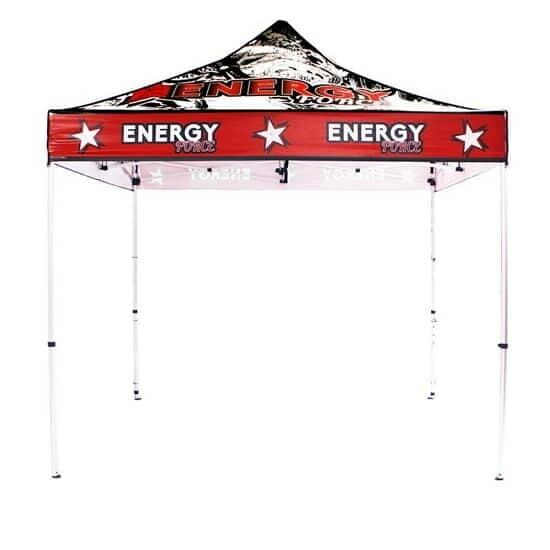 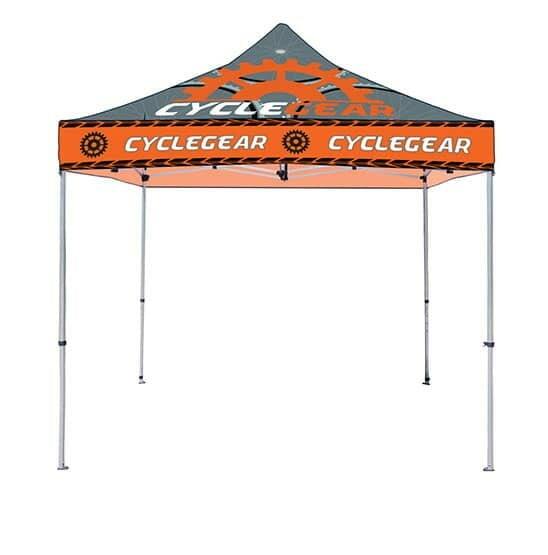 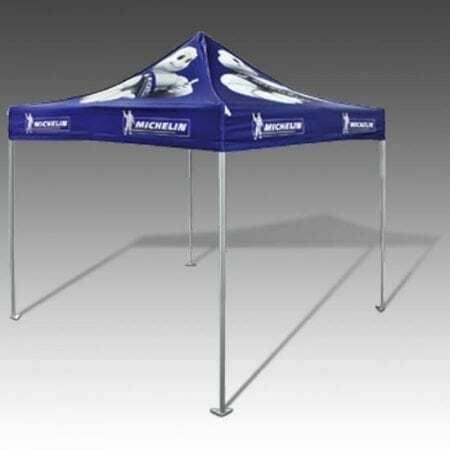 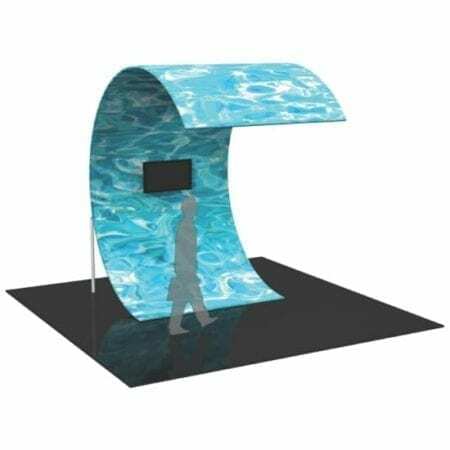 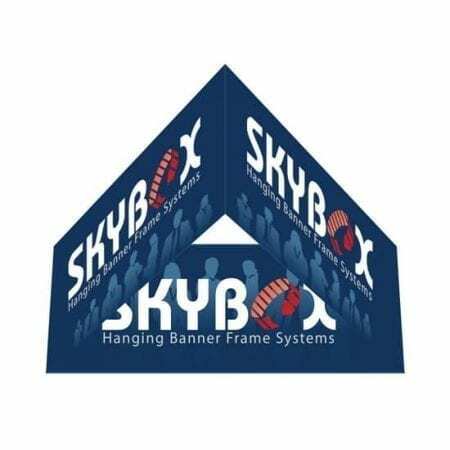 Canopies, including ceilings, umbrellas and canopy frames, should comply with height and line of sight requirements for the booth configuration being used. 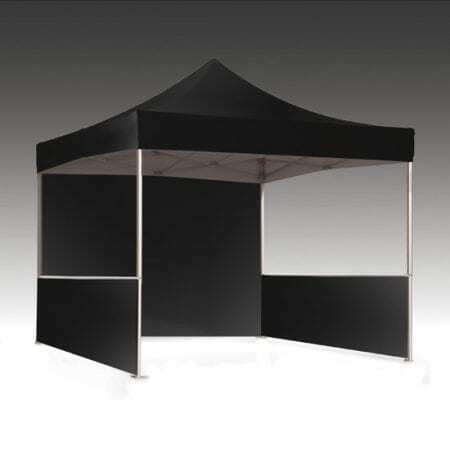 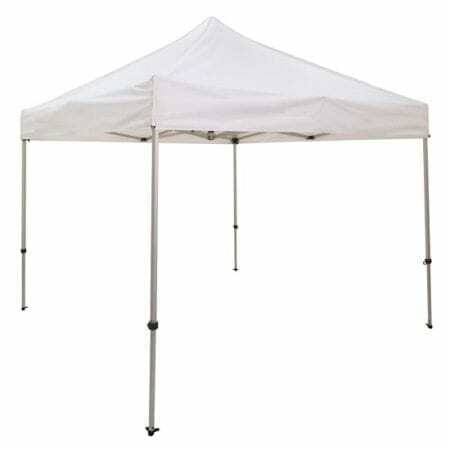 The base of the canopy should not be lower than 7′ from the floor within 5′ of any aisle. 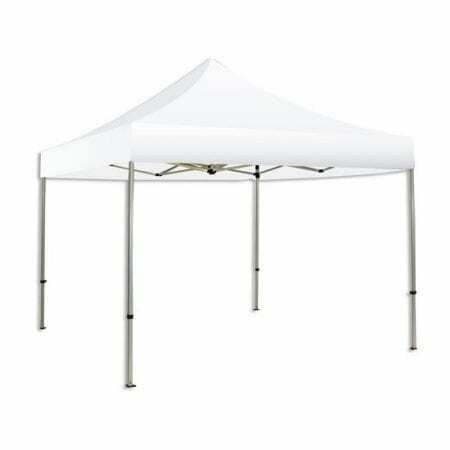 Canopy supports should be no wider than three inches.